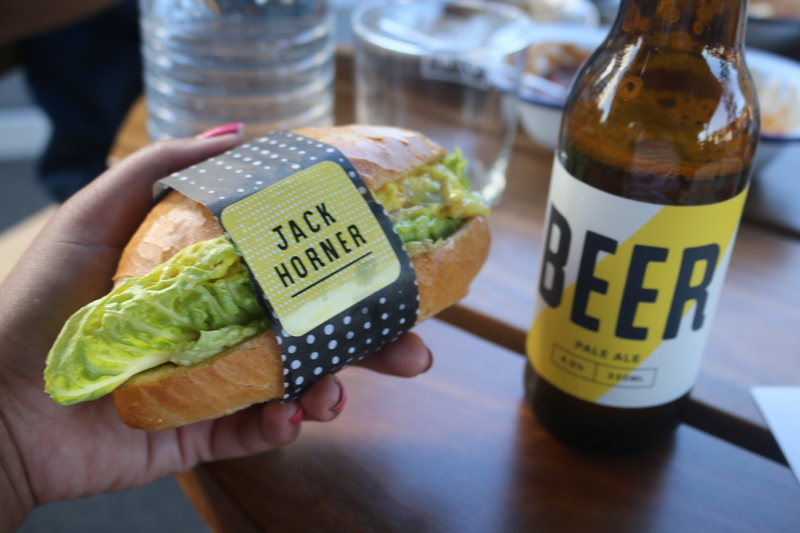 Jack Horner is a canteen style diner created by Matt Wilkinson and Ben Foster (the guys who brought us Pope Joan) and local produce store Hams and bacon. 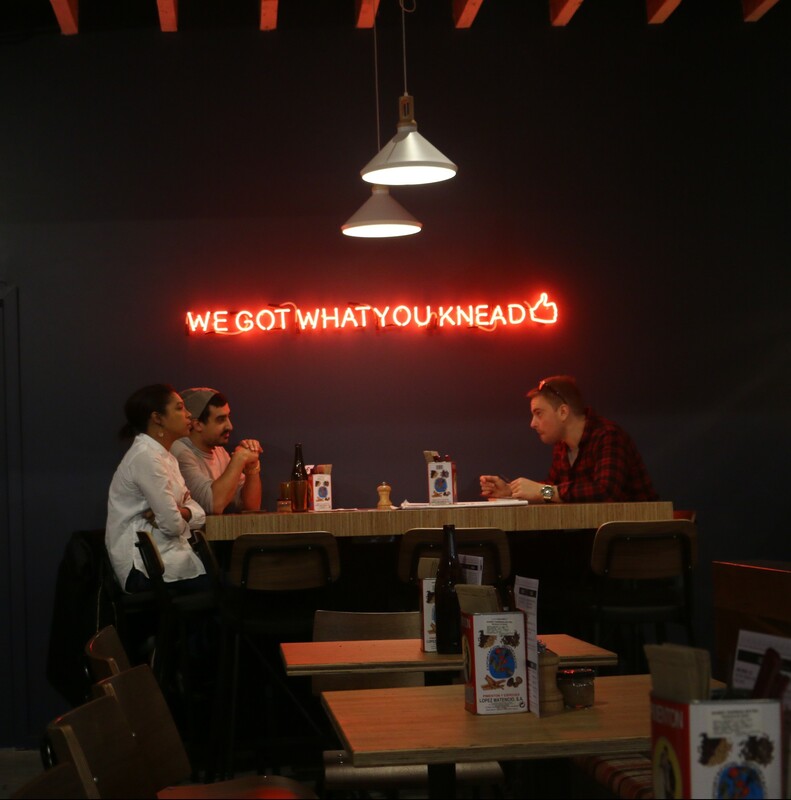 They serve up home-style canteen food like slow-cooked meals, salads, baguettes, jaffles, not to mention all day breakfast. They also have some sweet baked treats on the counter and make a range of in-house items (pickles, cheeses, yoghurt etc). 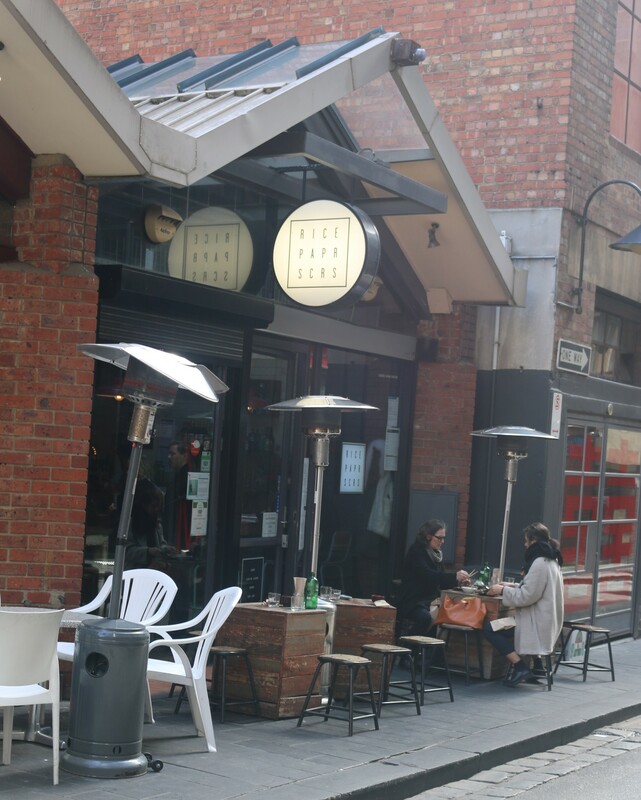 We sat outside in the sun and it was a lovely place to hang out, have a bevy and enjoy some tasty food. I had a latte and yay they had almond milk. If you can’t decide on what to order, they have combos. 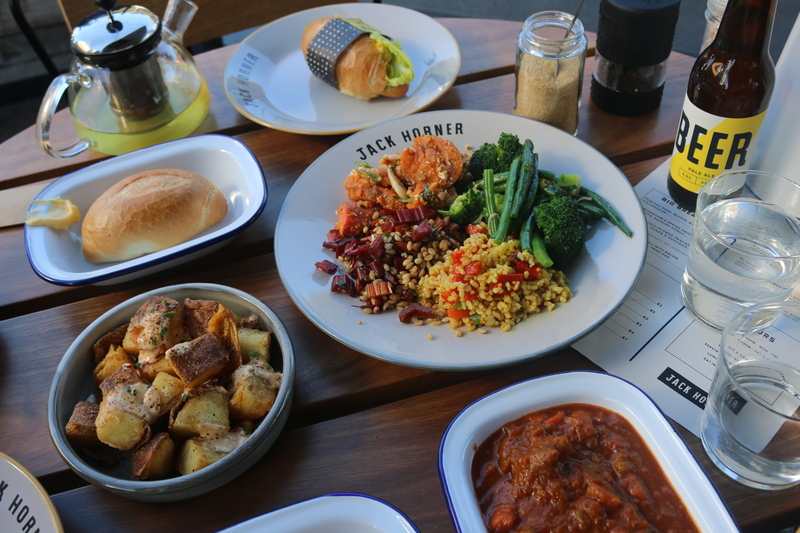 We chose combo 3, which is a nice little meal for two to share. 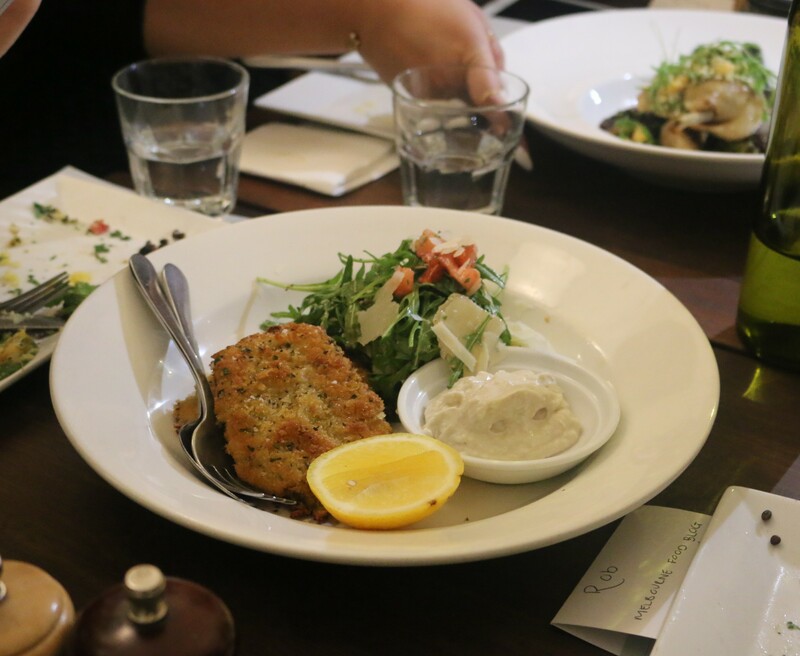 You get a plate of mixed salads, a meal ‘from the pot’ and two crusty bread rolls with myrtleford butter. It was a nice spread of food. We had a plate of assorted salads. The roasted sweet potato and carrot salad was amazing with baked crumbly sour cream bits and spring onion. The greens were good too, broccoli and beans lightly dressed. The Cajun rice had a really lovely flavour although it had these capsicum pieces which were a little bitter. And the tabouleh rendition with pearl barley was nice. They have a few meals ‘from the pot’ to choose from, which are slow cooked pots of justice. Warm, moreish and delicious. They change regularly. When we were there they had a bolognese, lamb tagine and a cauliflower curry. 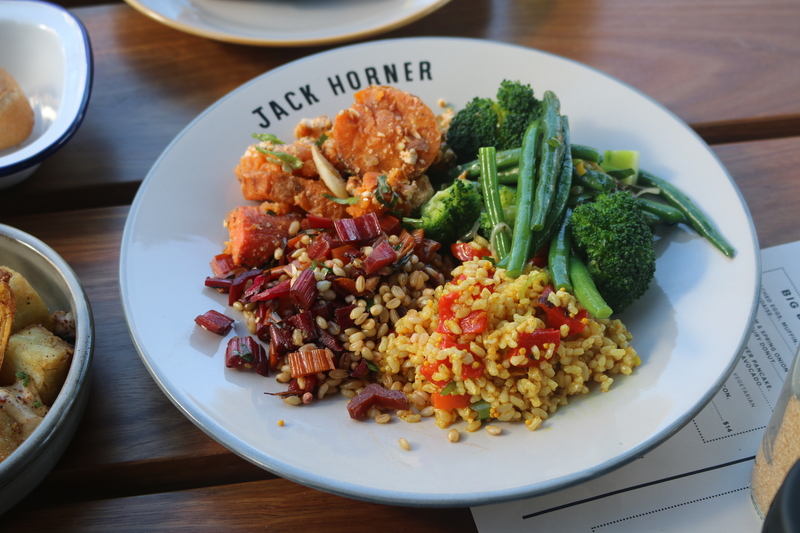 They usually have a veg option, which is good and the all the salads were veg too. We ordered the lamb tagine and it was delicious. It was full of flavour and the meat was falling apart. The bread rolls with myrtleford butter were yum. We also used them to dip in the tagine. It was good comforting food, so delish! Oh and the fried potatoes. 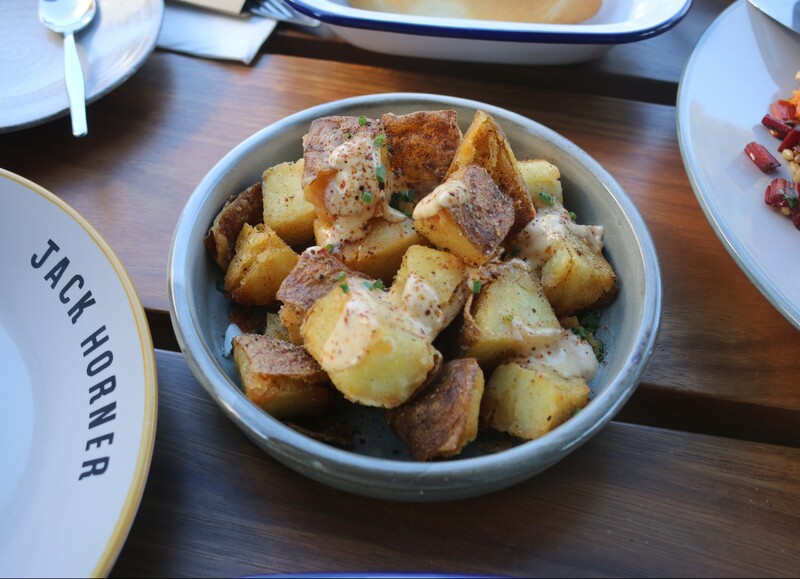 Crunchy spuds are always a winner. These ones were super crunchy and crispy. They were topped with a homemade sour cream and smoked onion salt. Yum. They had sandwiches and jaffles too. Bolognese and cheese jaffle, I will be back for you. We tried a fresh baguette, which was so cute and tasty too. It had fresh lettuce, poached chicken, and a curry mayo in a crusty baguette. Went perfectly with the local Jack’s beer, which was an awesome pale ale (which you can but in the grocery store). They have a little grocery section where you can buy a range of things, sort of like a specialty corner store. It’s a great place to have a hearty meal. 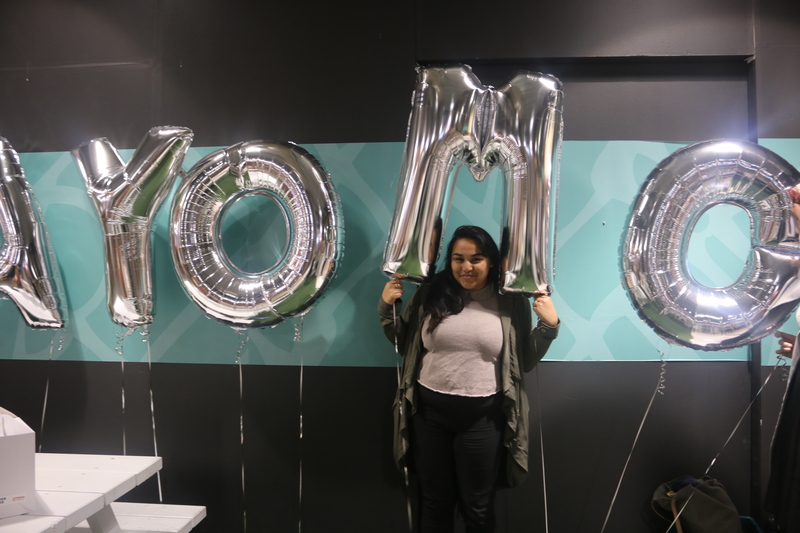 The staff were really lovely and the space outside is perfect for Spring weather. 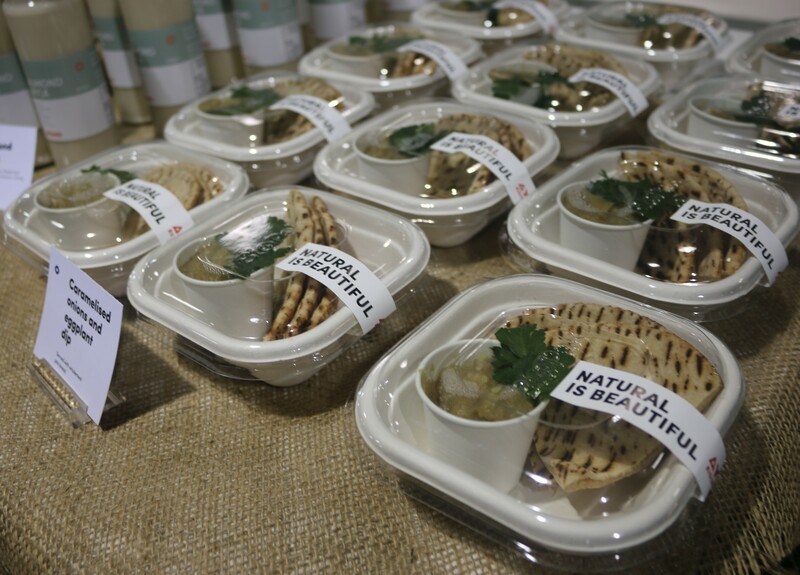 They use fresh produce and create tasty home-style meals, canteen style. 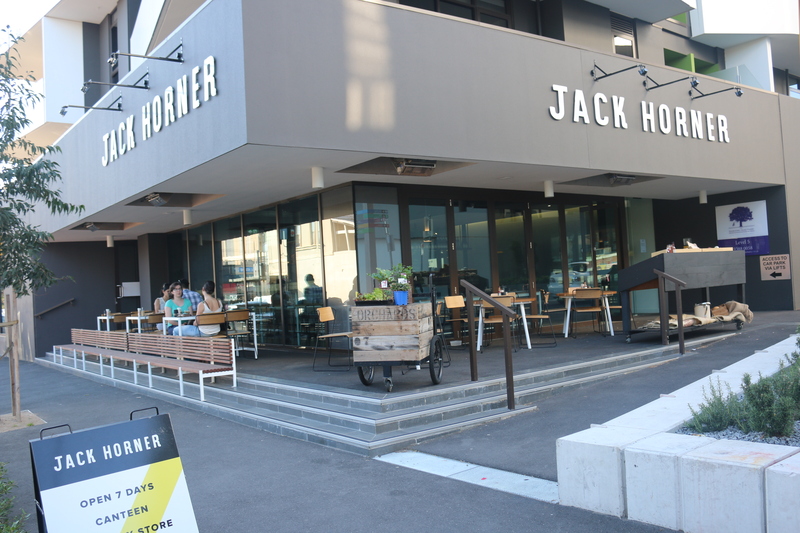 Note: Olive Sundays was invited as a guest to Jack Horner. Lee Ho Fook is a modern Chinese restaurant that is still fairly new to the city, it’s been open for about 7 weeks. 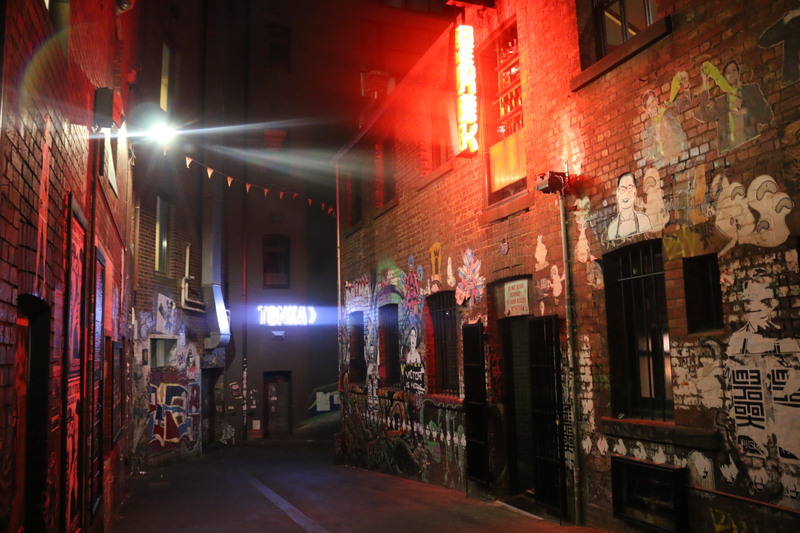 It was formerly a restaurant in Collingwood but has moved to duckboard place off Flinders lane in Melbourne. They serve Chinese food but it’s not your special fried rice, honey chicken kind of place (hehe) it’s a modern take on Chinese food and flavours. 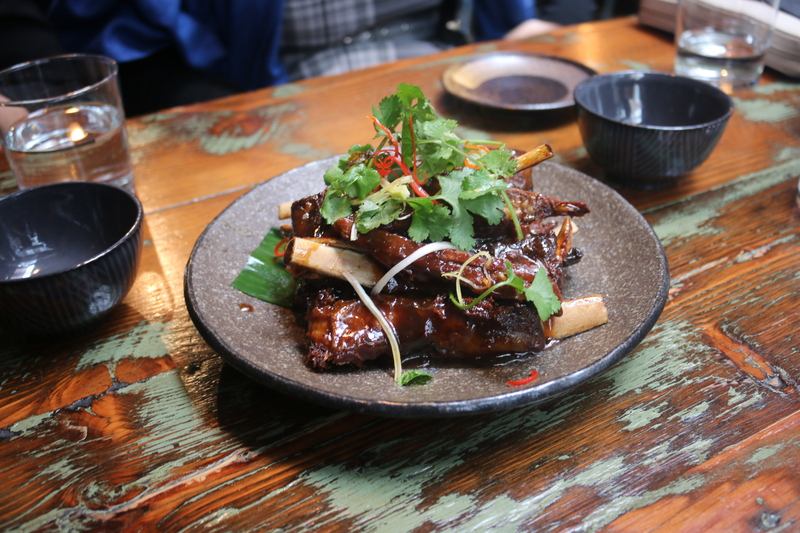 They play around with traditional flavours and come up with creative ways to express Chinese cuisine. The dining space is classy and relaxed. 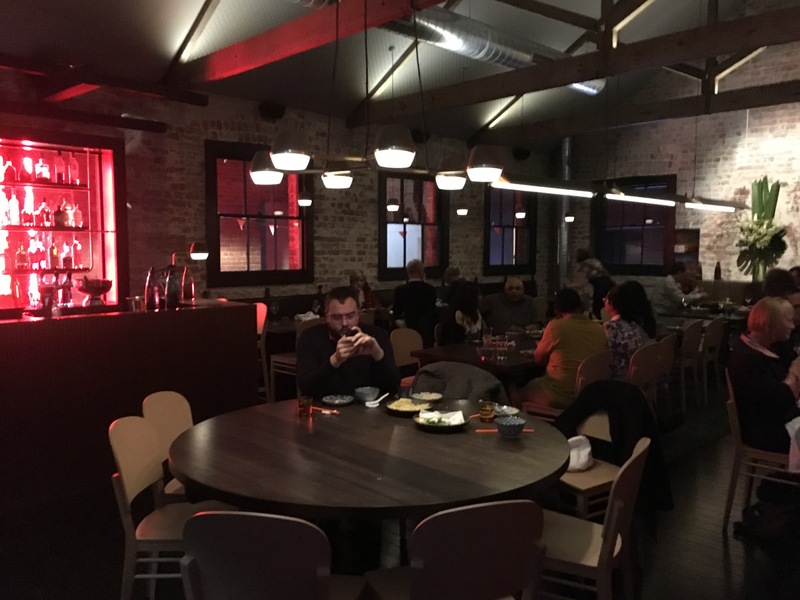 They have exposed brick walls and contemporary style lighting. A really nice atmosphere. The tea egg with avruga and dill was interesting. 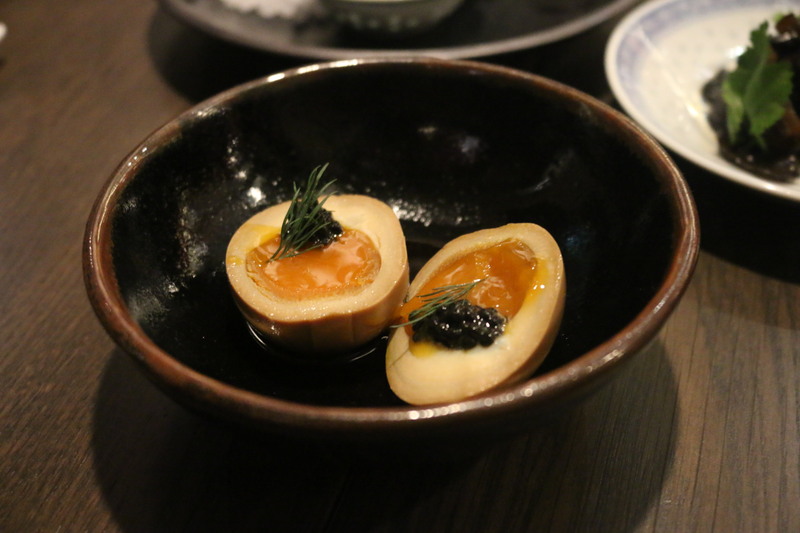 The outside of the egg was darkened by the tea and had a subtle tea flavour. The yolk was soft and sticky, the avruga caviar was salty and had a nice texture and it was topped with a miniature sprig of fresh dill. 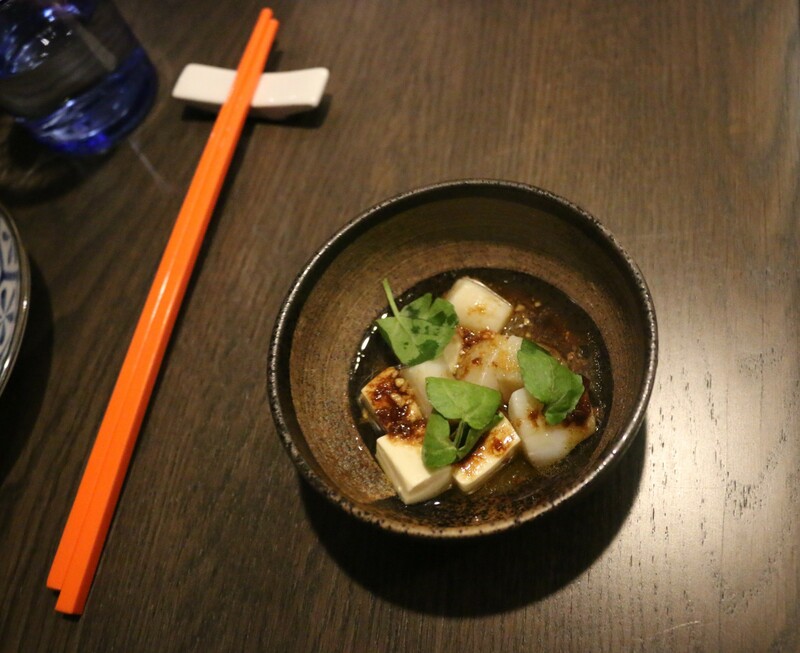 The scallop was chopped into chunks aside squares of silken tofu and had a warm soy butter with crispy garlic poured over. The raw pacific oysters came with a ginger dressing and a little bit of wasabi. 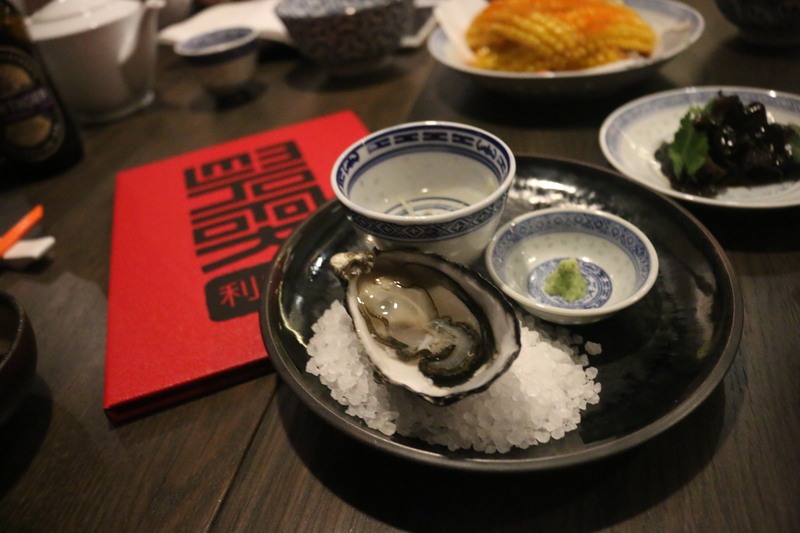 Amongst the fresh oyster sea taste was that hum of heat from the ginger and wasabi. 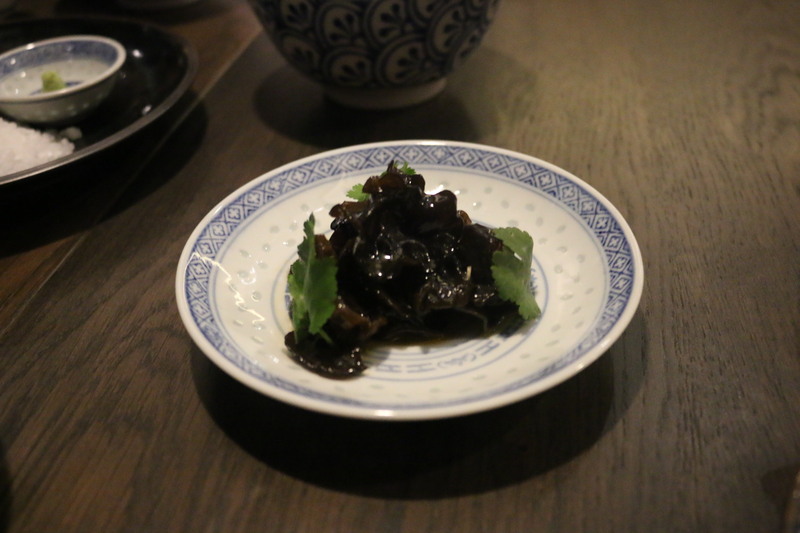 The black fungi and aged black vinegar was simple and wonderful. It had that silky texture and rich black vinegar flavour. The fried sweet corn looked great. 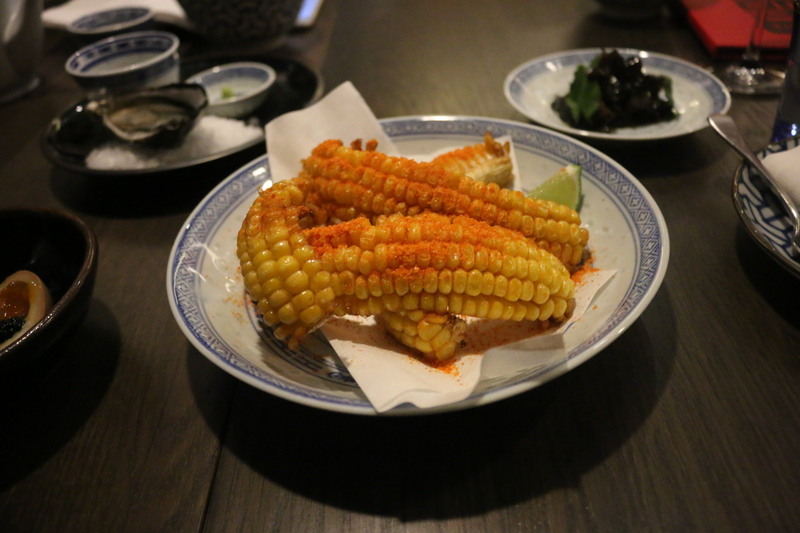 They were curled rows of corn off the cob that were sprinkled with a salted fermented chilli dust. Lee Ho Fook’s all famous ‘chinizza’ was amazing as expected. What the hell is a chinizza? A Chinese pizza duh! 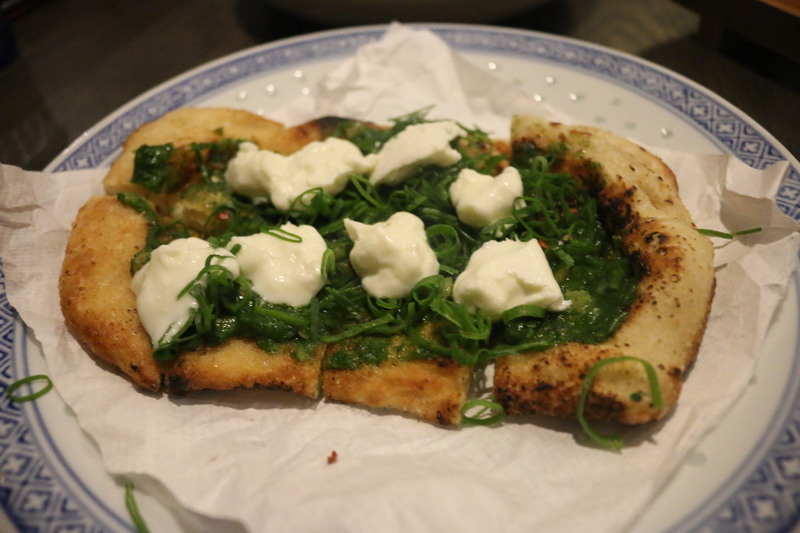 This Chinese spring onion pancake pizza creation was incredible. It was a fried pizza base with a generous amount of thinly sliced spring onion with torn pieces of mozzarella spread across the top. Yumness. 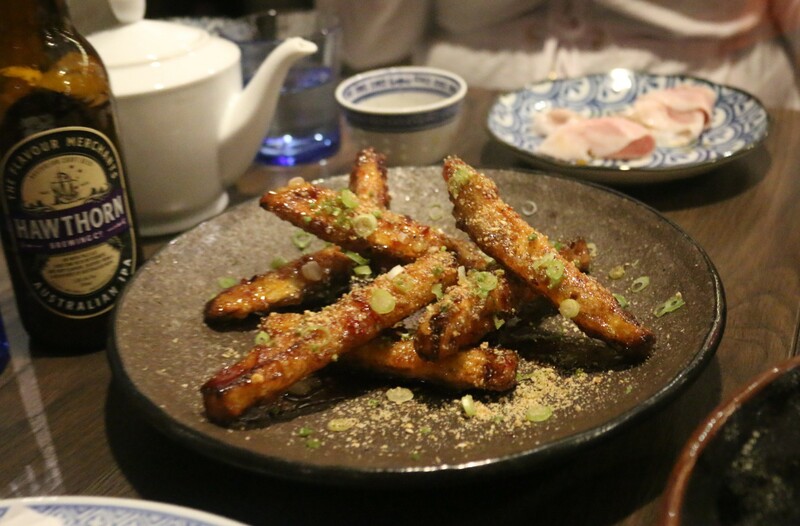 The crispy eggplant was delicious, they were like chips but Asian eggplant stlyle. They had a really crunchy crispy outside and were soft in the centre. They were dressed in a sticky spiced red vinegar sauce. 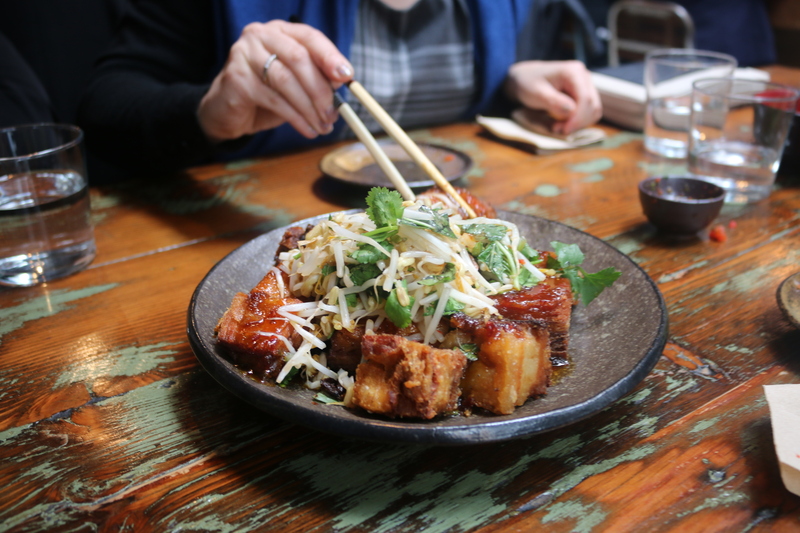 I love pork belly but I hadn’t had it this way before. 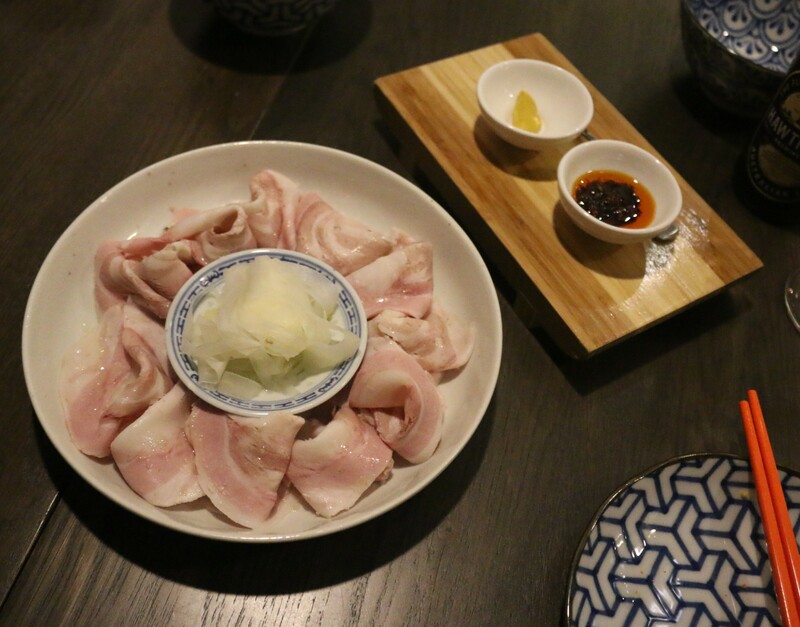 It was cold thinly sliced pieces of pork belly (sort of like a platter of cold shaved meat) accompanied by pickled fennel, mustard and chilli oil. Perfect flavours to accompany the pork. I enjoyed this heaps. The cabbage salad was fun with a range of textures. 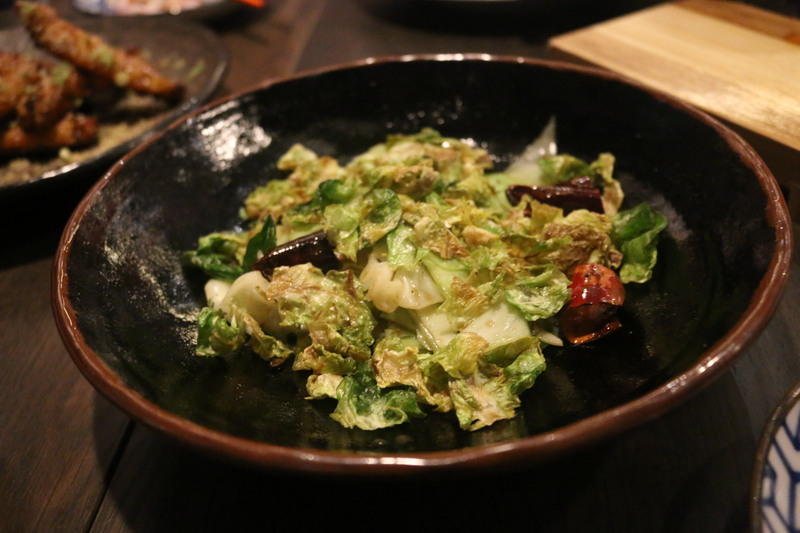 It had crispy deep fried bits of cabbage on top and sautéed cabbage underneath flavoured with dried Szechuan chilli and black peppercorns. 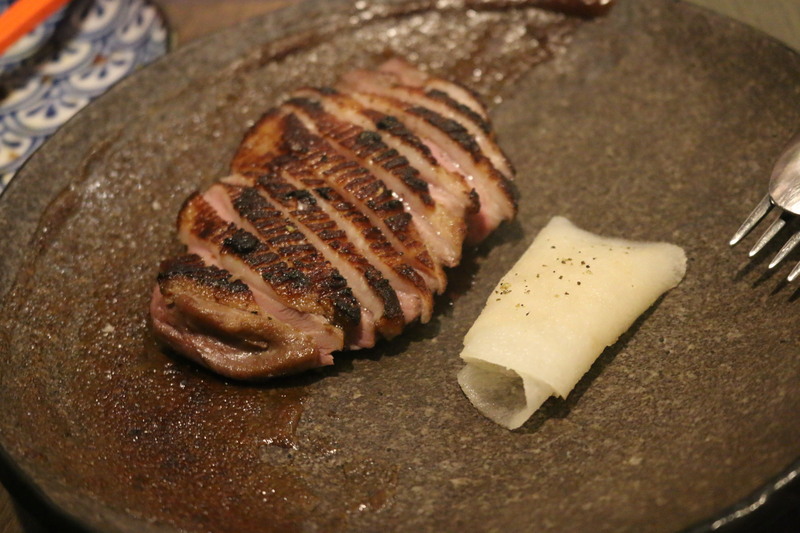 The duck was cooked to perfection. Thinly sliced and tender and pink in the middle. 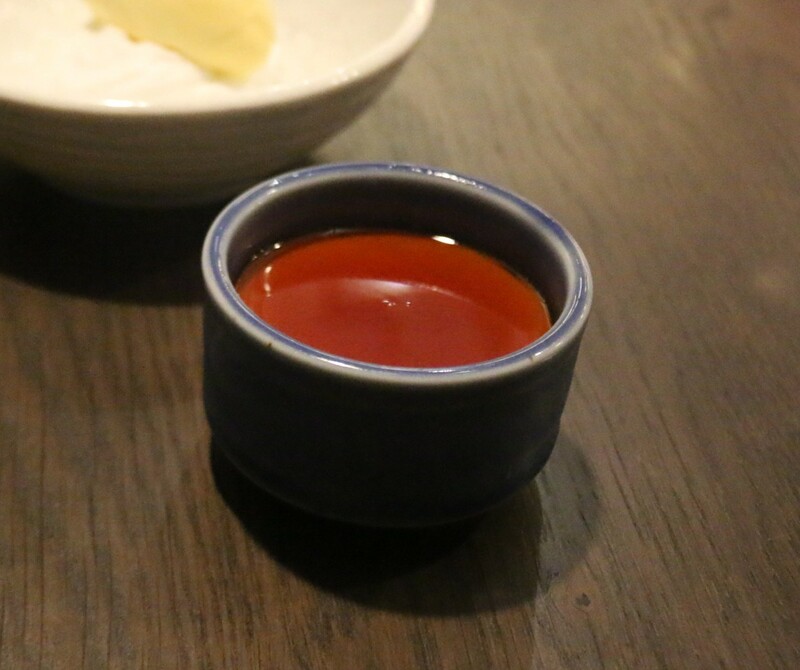 It had a miso and red vinegar sauce smeared around one side of the plate which complimented it well. And then it was accompanied by super thin slices of nashi with green Szechuan. The chilli nashi was insanely good. It was fresh and cool but hot with chilli at the same time. Love. 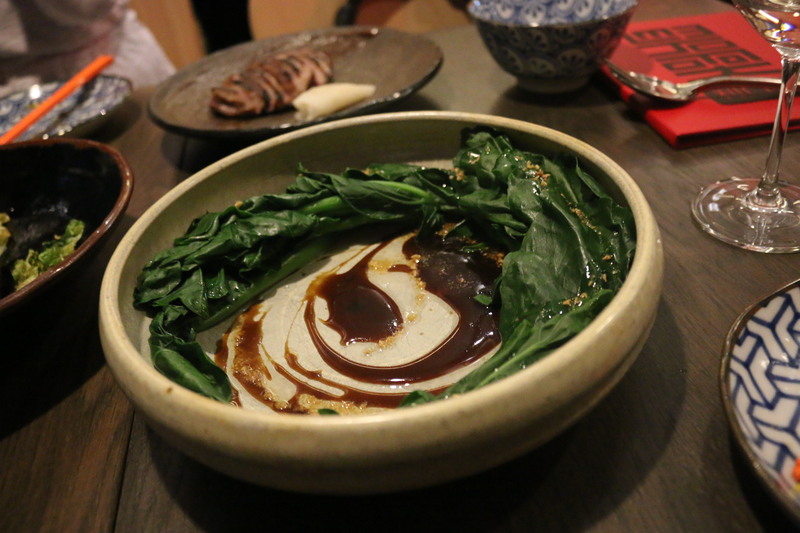 The steamed gailan (chinese broccoli) was yum, it was presented with the long stems placed along the edge of the bowl with their oyster sauce and crispy garlic swirled in the middle. These chocolate brownies had an Asian twist. It was rich gooey crumbly brownie paired with egg custard ice-cream and topped with wispy pieces of egg floss. Yum. 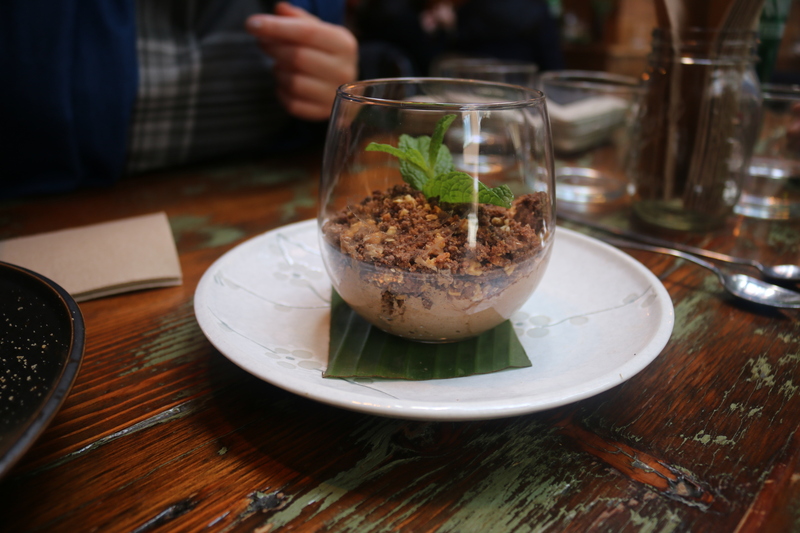 The coconut mousse was light and delicate and the corn icecream was lovely and smooth. The two subtle flavours went well together. 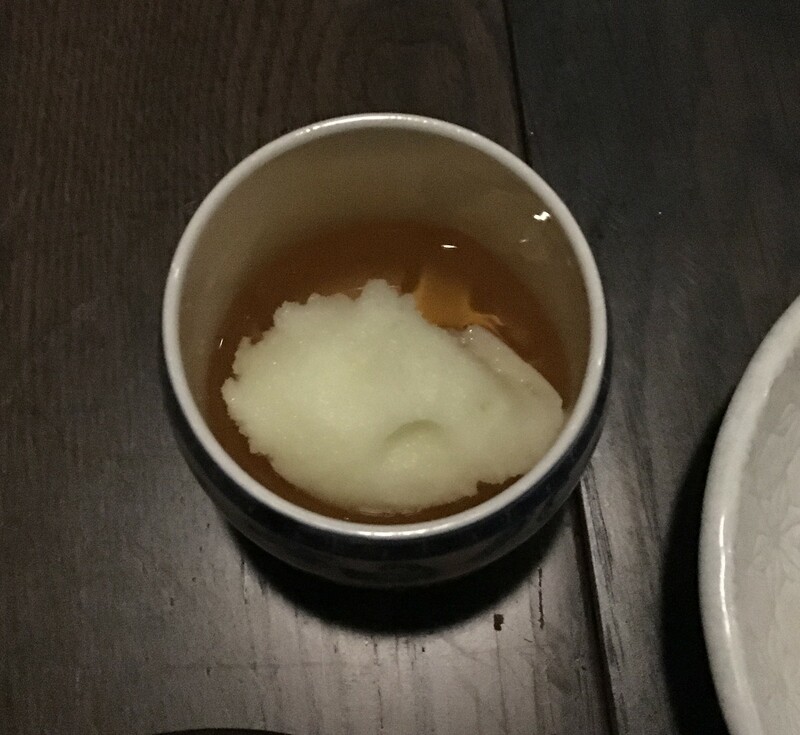 The apple Amaretto jelly had an apple granita on top. It was bitter, sweet and sour. A light refreshing dessert. 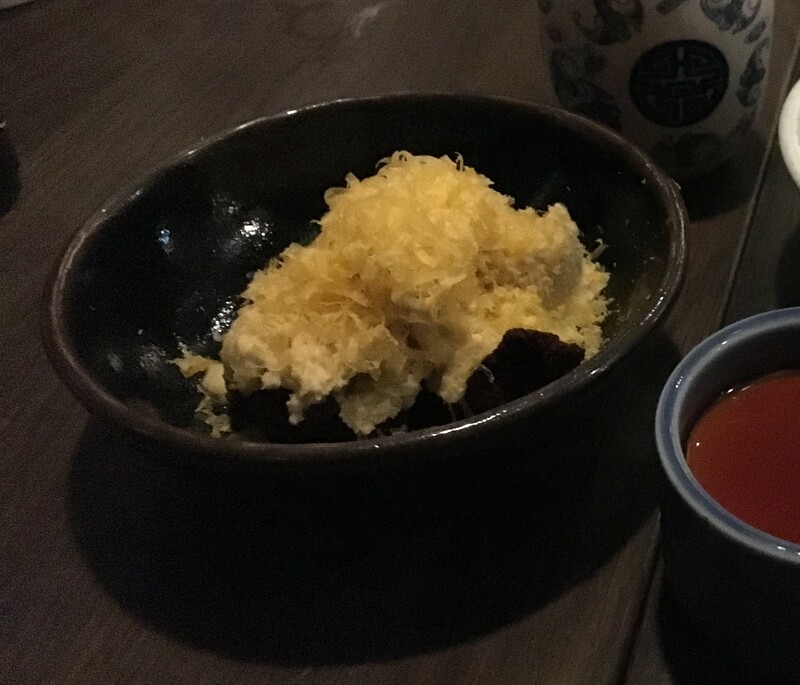 The Jasmine tea infused custard w burnt caramel was remarkable. It was like a thick custard flan with a prominent Jasmine tea flavour with a burnt caramel sauce, which had a beautiful bitterness to it. My fave dessert. They do two-hour session times for dinner so it’s good to make a booking. The staff were lovely and the food was delish. 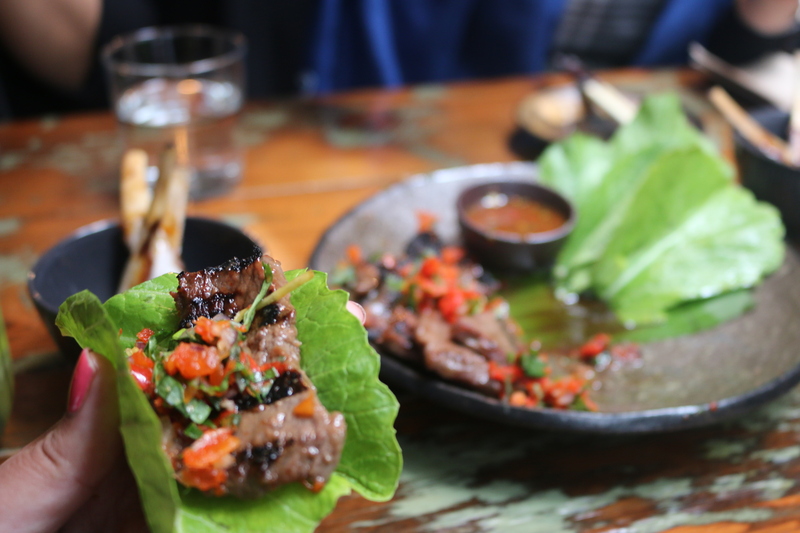 The menu is mainly share plates so you can order a bunch of things and share, which is great. They also have a great wine selection. As we walked out, this painting was on the wall. 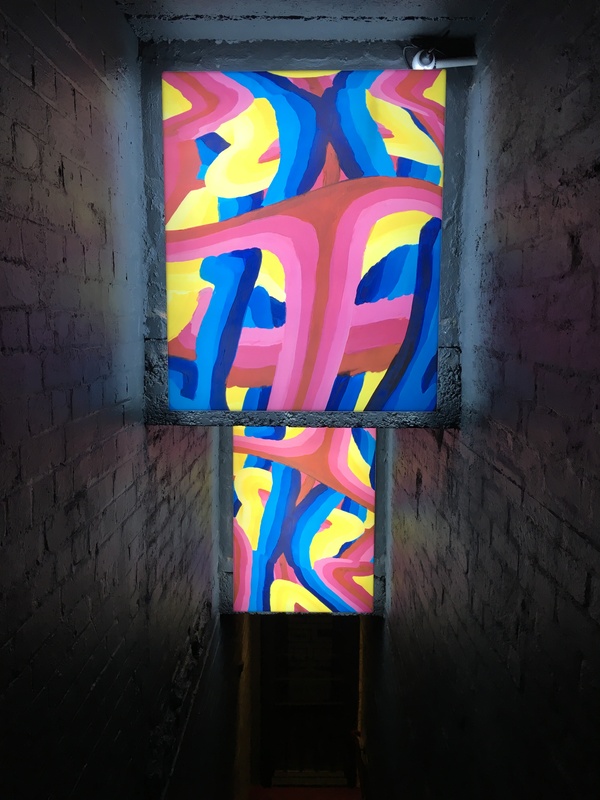 It gave me happy vibes…loved it. I heart Lee Ho Fook! 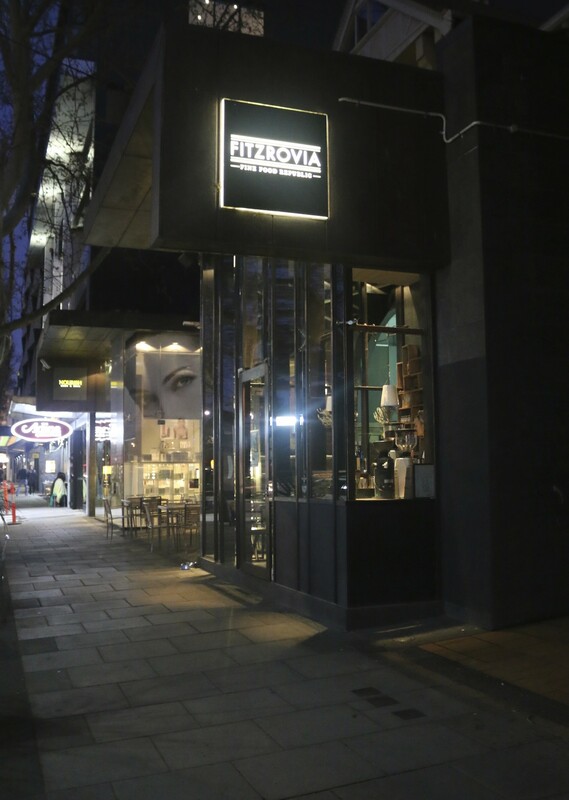 Fitzrovia is a restaurant in St Kilda where they do home-style (comfort food) meals that warm the heart. 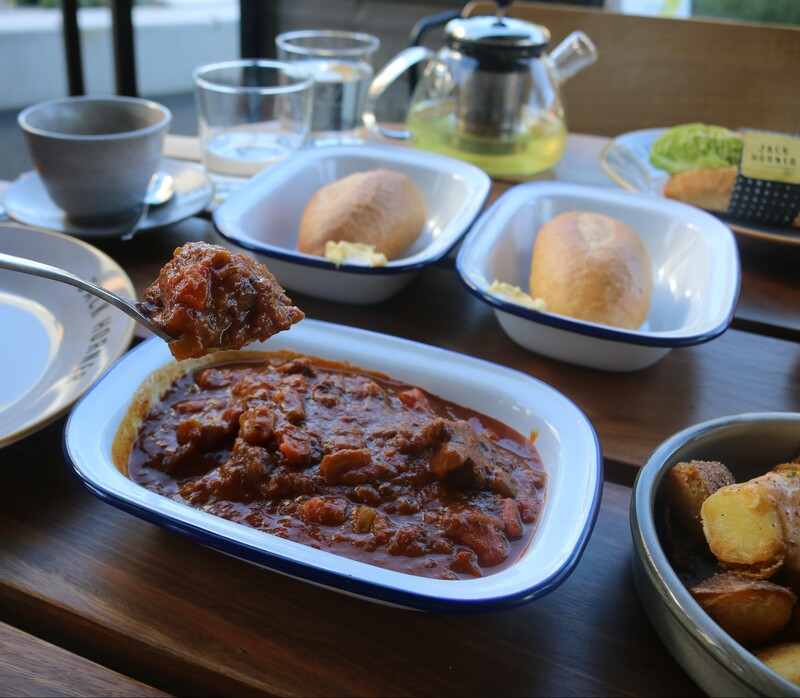 The dishes are tasty and well executed and inspired by provincial Italian and british cuisines. 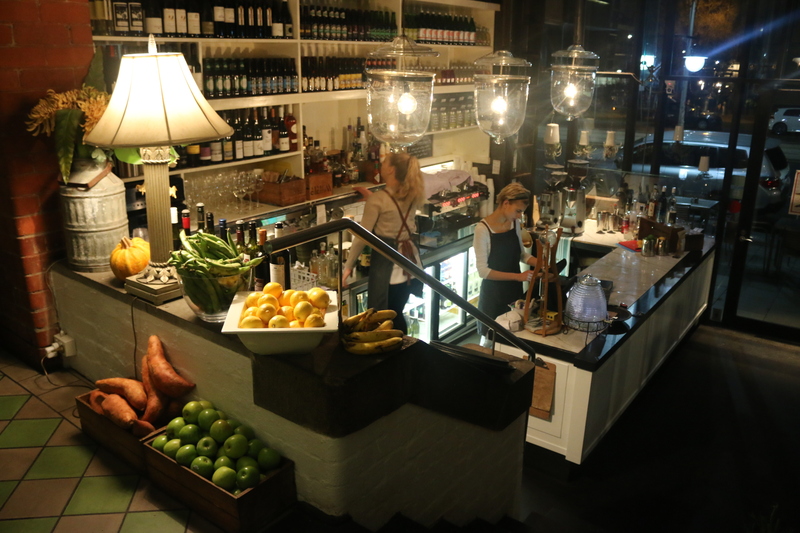 They have a focus on top quality, local ad seasonal produce and Chef Paul Jewson has recently created a new spring menu. Fitzrovia feels like you’ve walked into somebody’s home. It’s got a warm feeling about it. 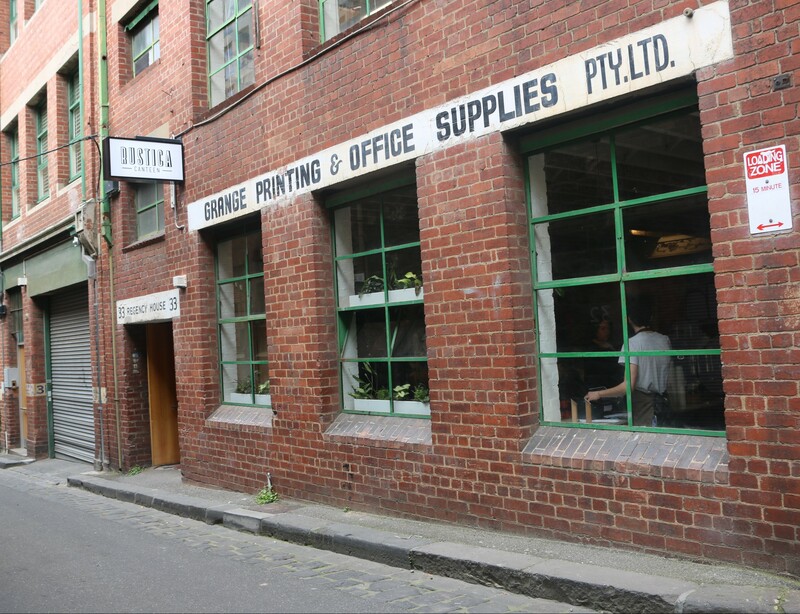 The dining space is decorated with boxes of fresh produce, bookshelves, old typwriters etc. 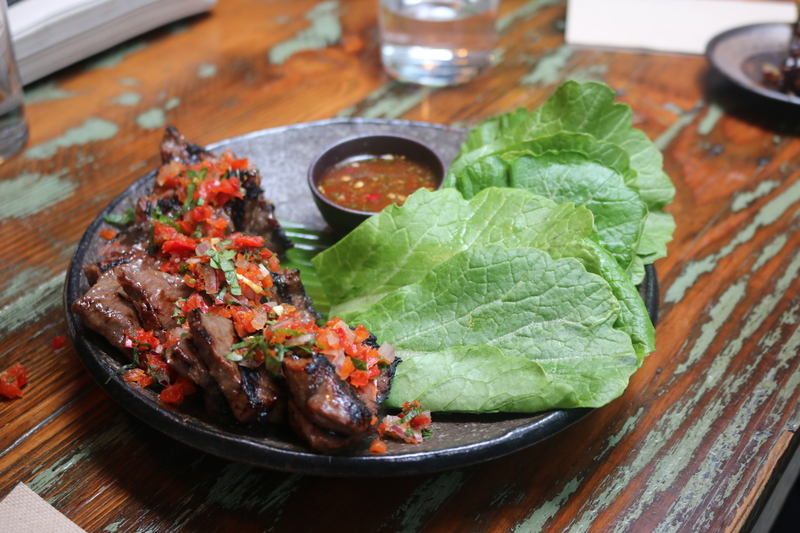 And to go with the feel of the place, the meals are served in a rustic home-style manner and cooked with lots o’ love. The hot and sour salt and pepper calamari was delicious. It had a crisp light batter and was soft and just melted in your mouth. 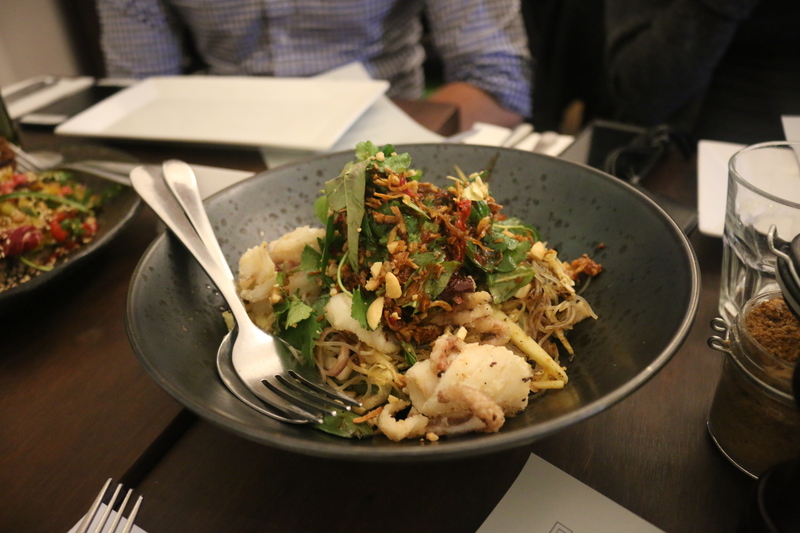 The calamari was sitting on a green papaya salad with vermicelli noodles, coriander, mint, lime, cashews and a roast chilli dressing. I loved that the salad was cold but the calamari was warm. It was packed with flavour. It was fresh, hot and sour and salty and spicy. Yum. The falafels had chickpeas (naturally) and organic black quinoa, which was interesting. They were really tasty and went perfectly with the sumac spiced labne which was like an aromatic yoghurt dressing. The falafel sat on a bed of turmeric roast cauliflower, smoked eggplant caviar, minted dukah and pomegranate. Loved the pops of fresh pomegranate. Loved the chicken saltimbocca it was delicious. 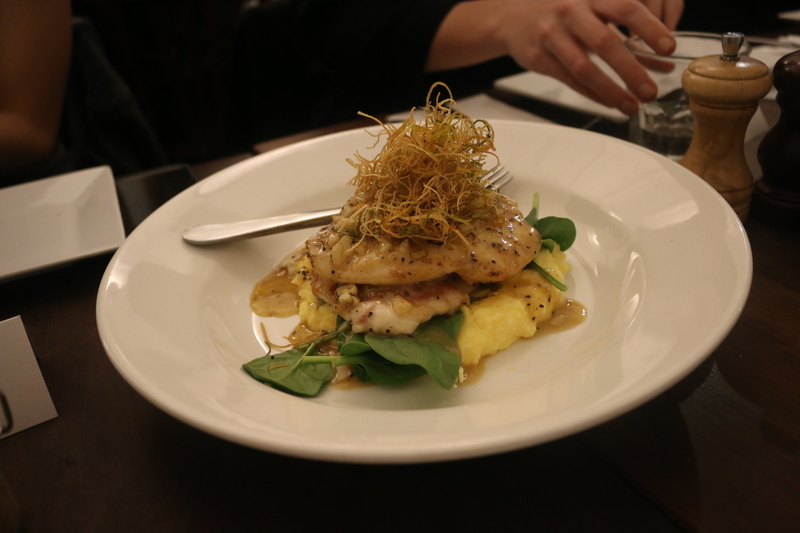 It was free-range chicken breasts wrapped with crispy prosciutto, sage and tallegio (cheese). It was sitting in a soft mascarpone polenta. That polenta! It was so amazing I could totally swim in it. And it was topped with crispy fried wisps of leek which were tasty and added crunch. This was one of my faves. The whole grain new seasons asparagus salad had a nice texture. 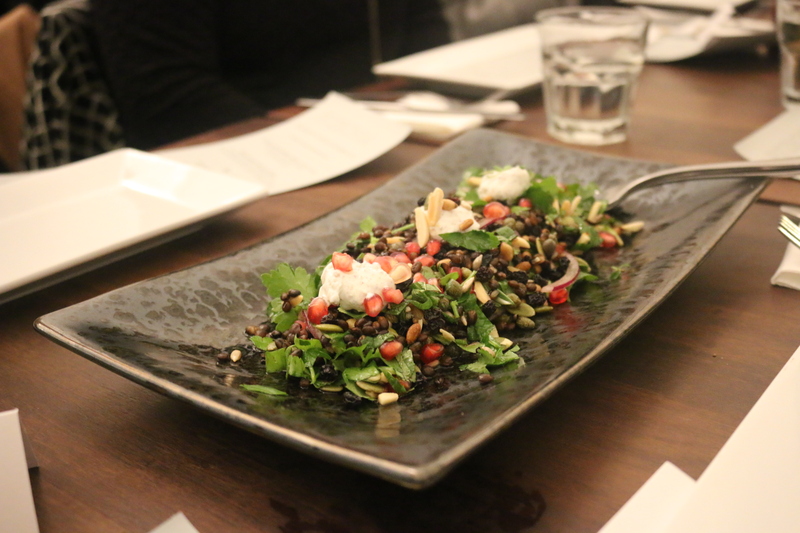 It had lentils, black barley, pine nuts, almonds, pumpkin seeds, herbs, spanish onion, lemon and fresh pomegranate. It was served with a tahini labne. I wasn’t sure where the asparagus was but it was really tasty so I didn’t mind much. 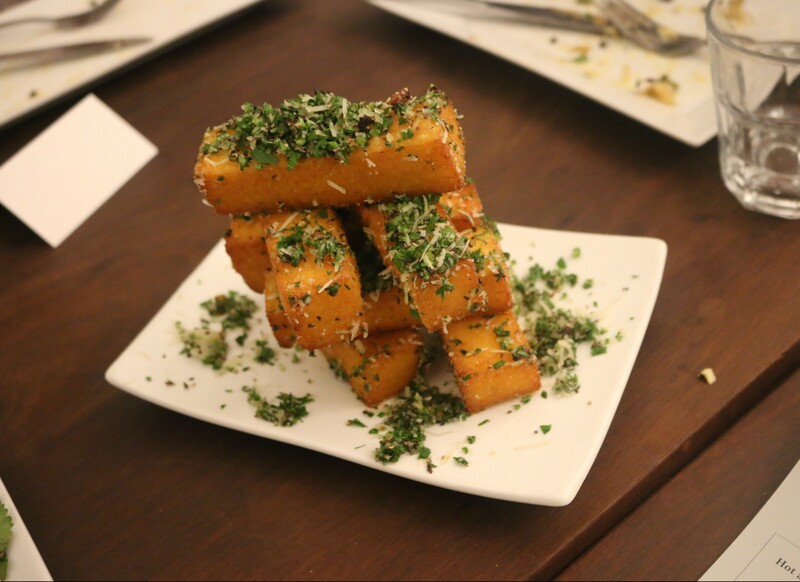 The Fitzrovia signature polenta chips looked like a stack of jenga. Edible jenga of course. They were golden and crisp on the outside and smooth and silky in the middle. They were covered in truffled parsley & parmesan. You could smell the truffle as soon as they hit the table. Delish. The South Gippsland milk fed veal fillets Milanese were like awesome crispy snitzels. The meat was so tender and the lemon zest, parsley & parmesan crumb was beautifully crunchy. It was paired with an anchovy mayo and a simple salad with organic truss tomato, rocket and shaved Parmesan, which was really nice. 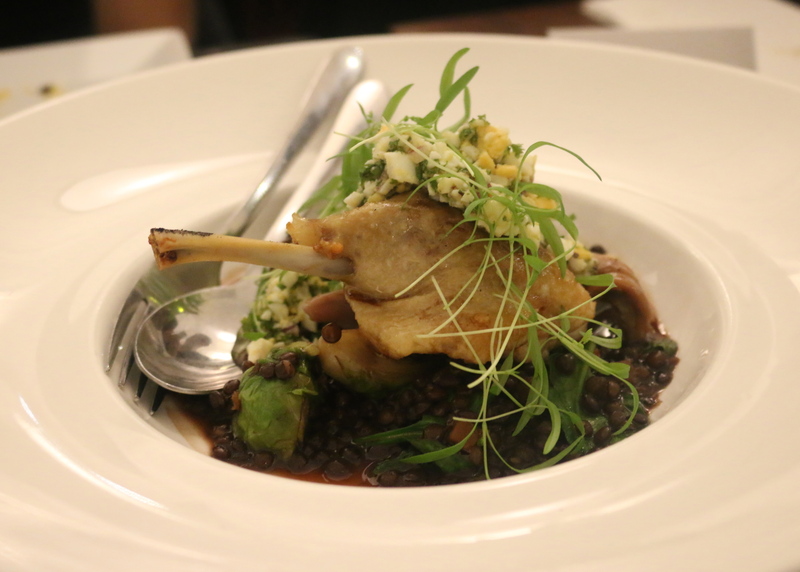 The thyme and garlic confit free range Ovens Valley duck leg was tasty and moist. It was served with braised black lentils which were just cooked (still had a nice bite to them), brussels sprouts (who knew I liked them) and a gribiche sauce. The chef Paul Jewson likes to describe the food as ‘what I imagine chefs would like to cook at home on their days off’ which makes sense. 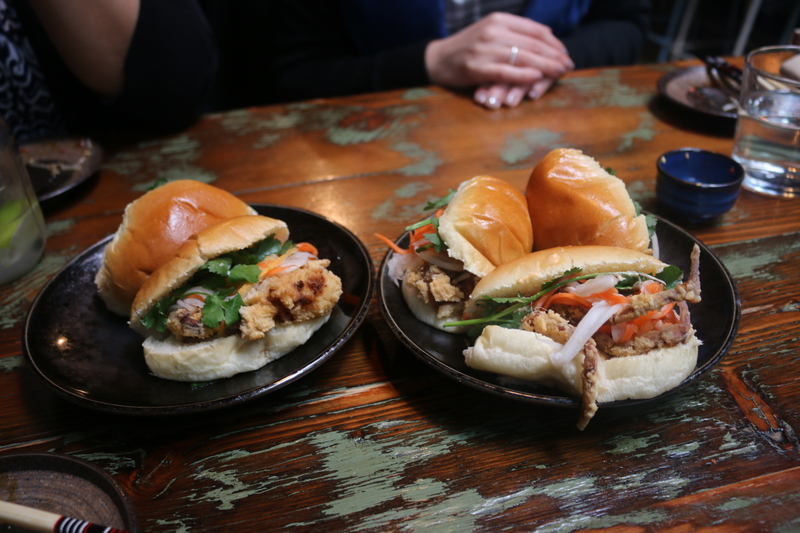 It’s home-style food but cleverly put together. 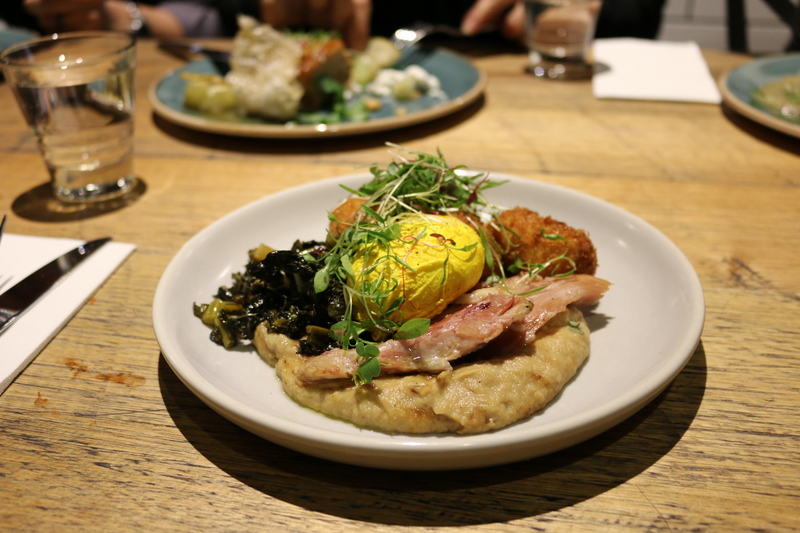 Fitzrovia is a great place to visit for breakfast, lunner or dinner. Dinners are back hooray. 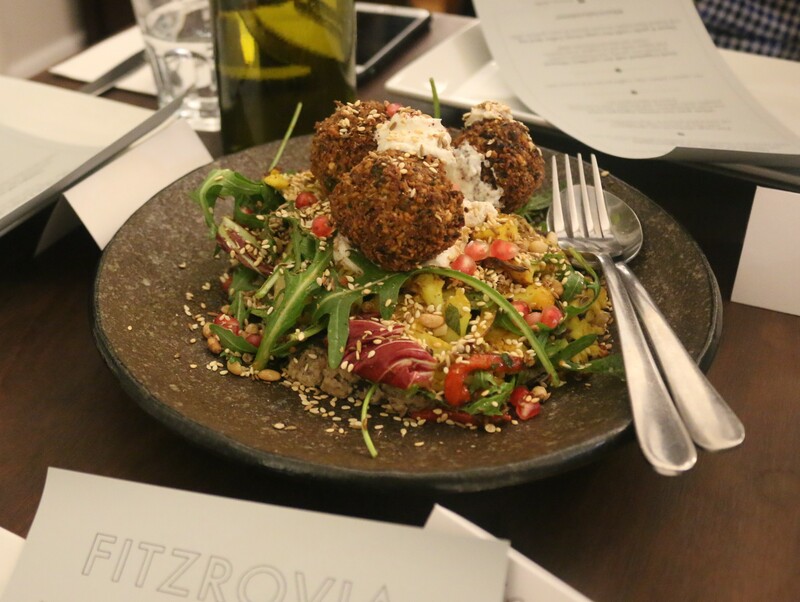 Note: Olive Sundays was invited as a guest to Fitzrovia. 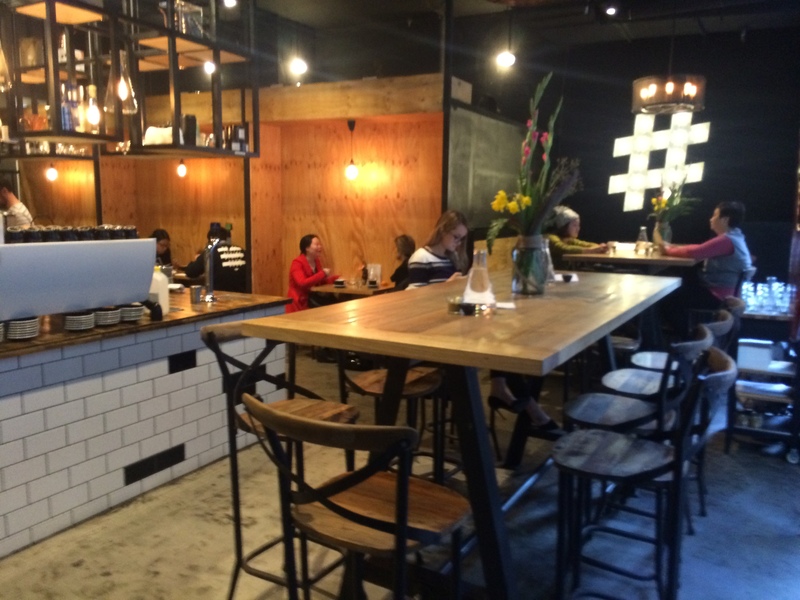 Hash Specialty Coffee and Roasters is a restaurant open for breakfast and lunch. They have an exciting menu and pride themselves on using top quality ingredients. 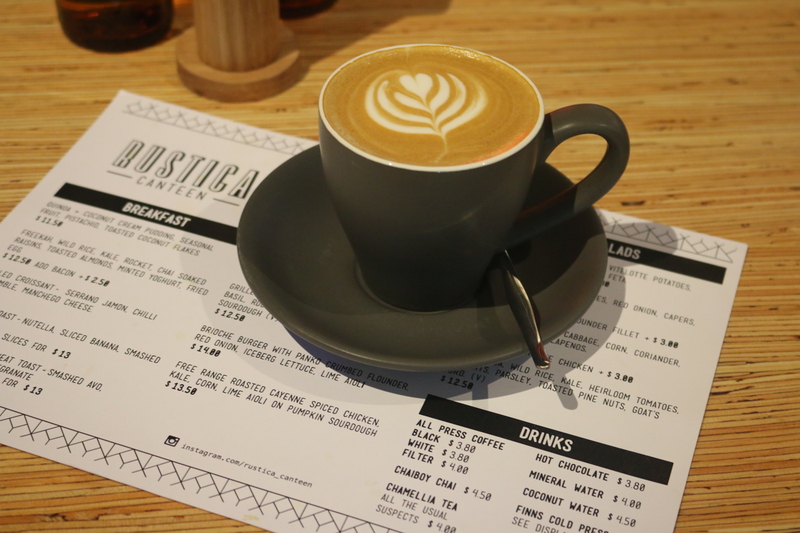 The food is creative and they do a great coffee. They also do a great hot chocolate. Fairy floss in my hot chocolate? Yes please! Oh the theatre. 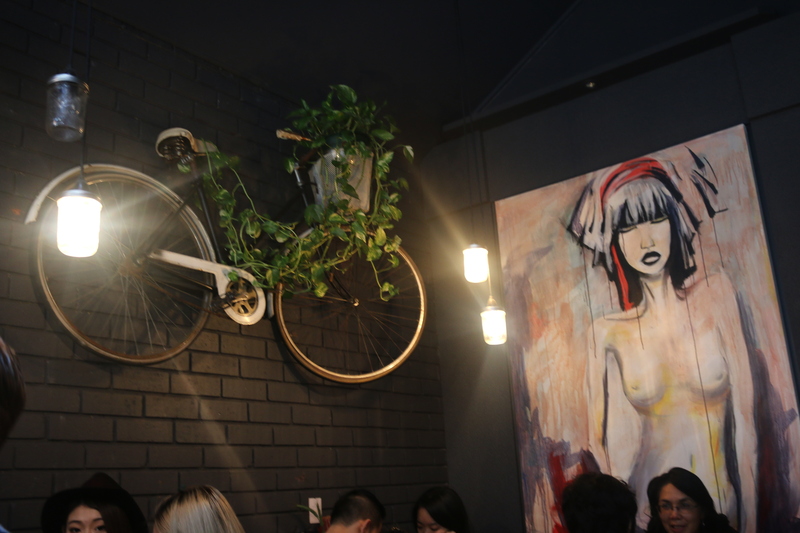 It has a relaxed and modern atmosphere with a bar in the middle and a big illuminating hashtag light on the wall. 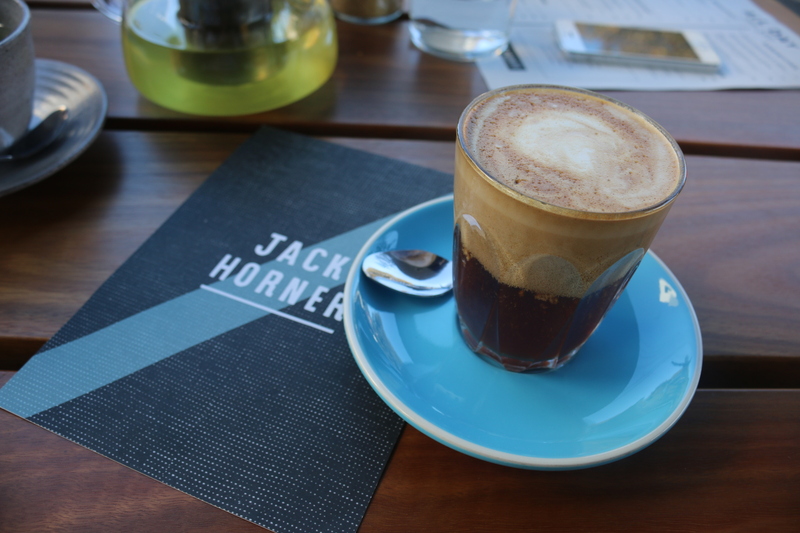 They specialise in specialty coffees. Hash is known for it’s signature hot chocolate. 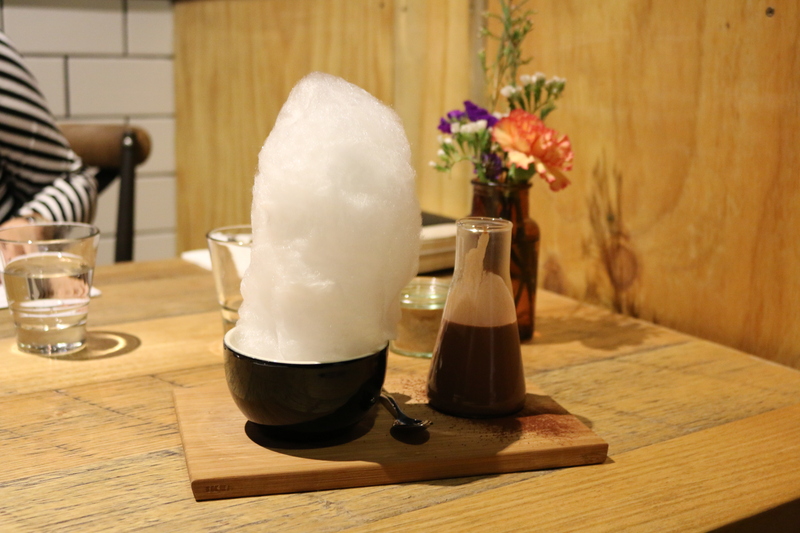 It is a cup filled with a mountain of fairy floss accompanied by a beaker of hot chocolate. You pour the hot chocolate over the fairy floss and it slowly dissolves and at the same time effectively sweetens your hot chocolate. However if I am to be completely honest it didn’t happen so smoothly for me. When I saw people doing it around me it looked so easy but unfortunately my poor pouring skills resulted in a last second panic, where I had to quickly grab my teaspoon and hold up mount fairy floss before it collapsed outside of my cup. It all got into the cup though and that’s the important part right? I thought it would be super sweet with what looked like a whole fairy floss in the cup, but the hot chocolate was dark cocao (85%) so the bitterness balanced the candy-like sweetness perfectly. It was rich, full flavoured and delicious. And it still had a slight dark cocao bitterness to it. Loved it. The rosted pork belly was amazing. It was soft and juicy with a crispy top. There was a piece of puffed pork crackling (I know it as chicharron) which added a nice crunch element. There was an apple puree, thin slithers of baked apple and juicy poached apple pieces. And we all know how well apple goes with pork. 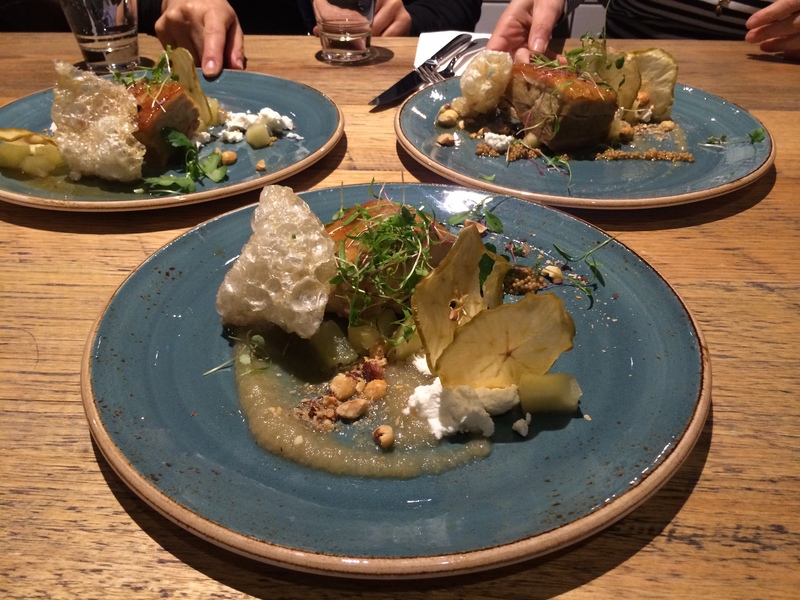 And then it was topped with some goat’s cheese, pickled mustard seeds and hazelnuts, which added a whole new level to pork and apple. It was a clever dish and very delicious. The leek and cheddar croquettes were tasty. They had a crunch on the outside and were smooth and creamy on the inside. The cauliflower puree was so good and the ham hock was melt-in-your-mouth. The cavolo nero (kind of like kale) had a tangy bitter sort of taste, which was nice when eaten with the other elements. And there was a yellow stained turmeric poched egg in the middle that brought it all together. The grilled banana and pecan loaf was insanely delicious. For some reason I thought it would be a little dense (maybe the word loaf) but I was completely wrong. It was quite sponge like and soft and fluffy. The banana peacan flavour was delicious. 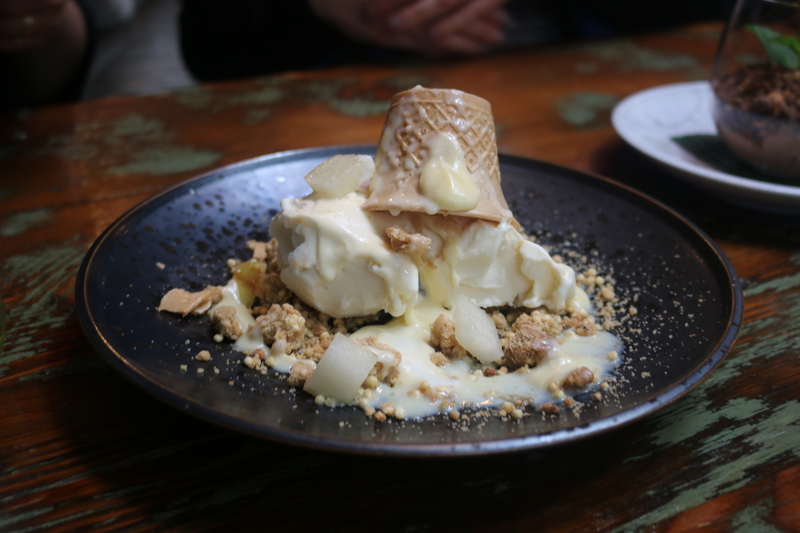 It was filled with white chocolate custard and topped with burnt honey mascarpone (omg!). The combination was heavenly. 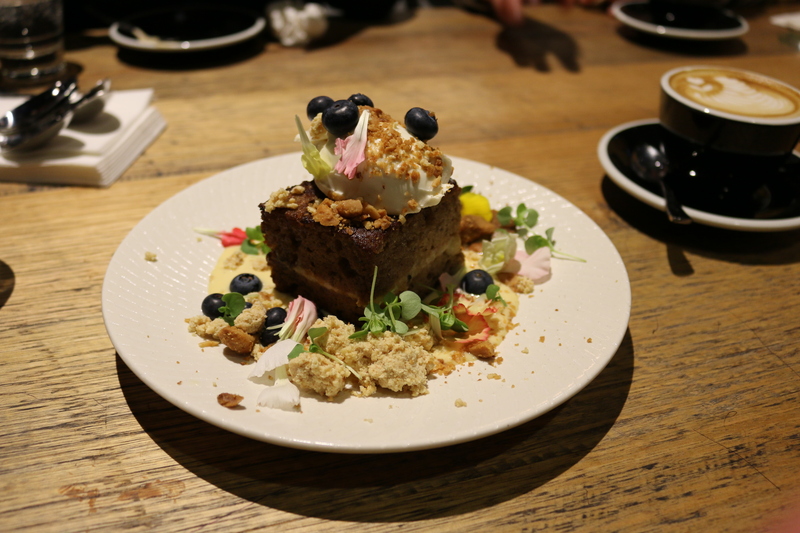 It had all these bits and pieces that made it even better like whole macadamias, a milk crumb and fresh blueberries. Lovely. This is a cool space to hang out and have brunch. They have a great menu and the dishes are well executed. Not to mention the coffee and the fairy floss hot chocolate. Fairy. Floss. Hot. Chocolate. Nuff said. 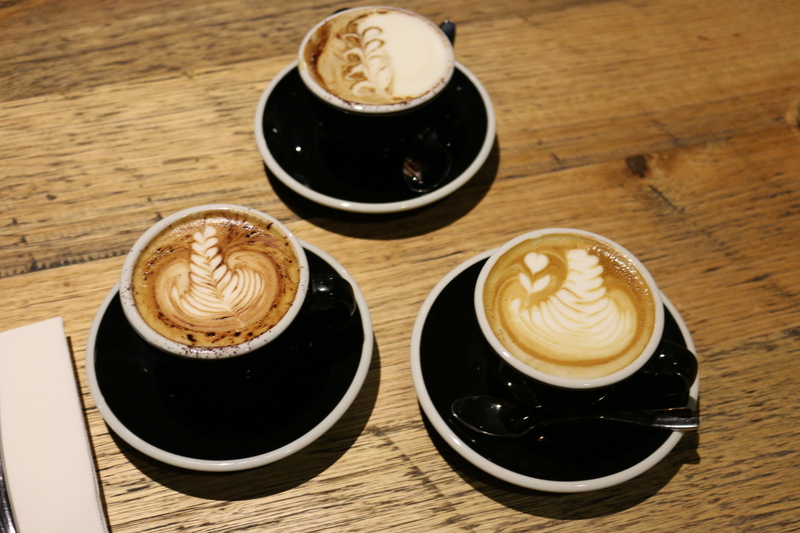 I heart Hash Specialty Coffee and Roasters! 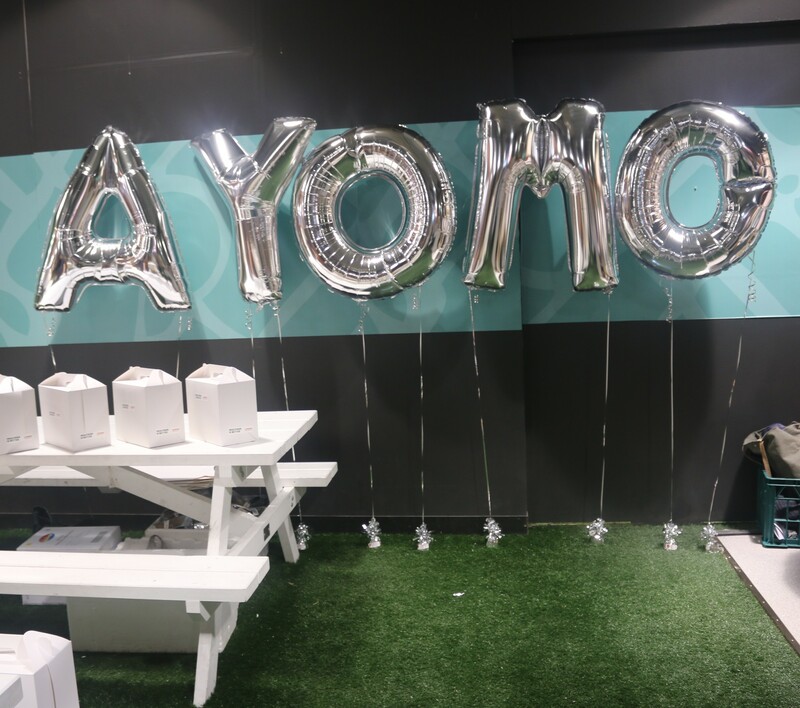 Ayomo opened a kiosk in QV that houses a variety of healthy cold pressed juices and other healthy bits and pieces. It’s a cute little grassy area with park benches where you can enjoy some juice and some healthiness. 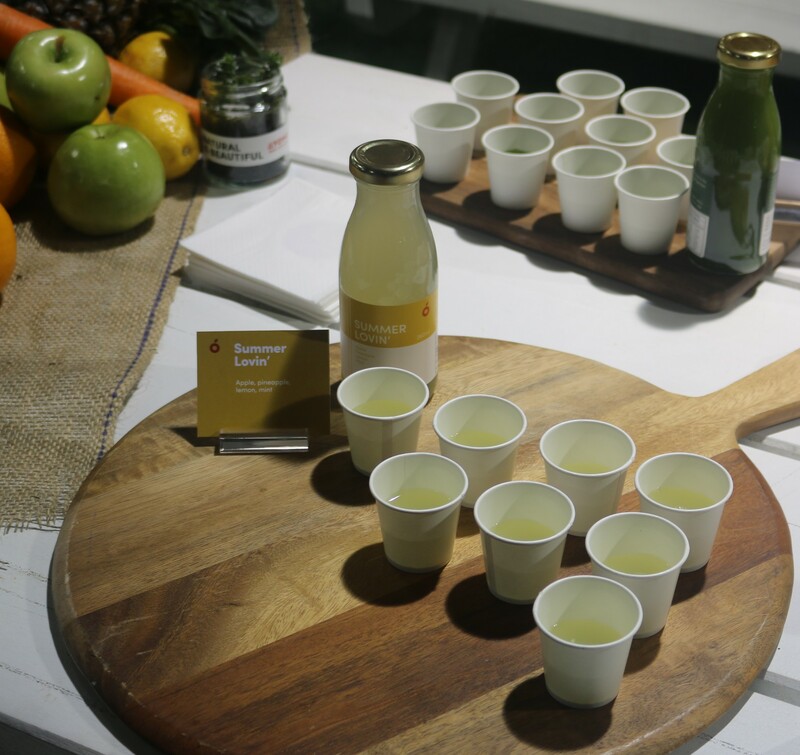 Their cold pressed juices are ‘fruit to bottle and nothing in between’ as per their motto, which means you can be assured that all the juices are full of fruit, vegetables and healthy goodness. No guilt here. They have a range of different juices and if you’re keen to do a little bit of spring cleaning for your body, they have some juice cleanse packs in a one day, three day or five day pack. It’s spring people! Now is the time. 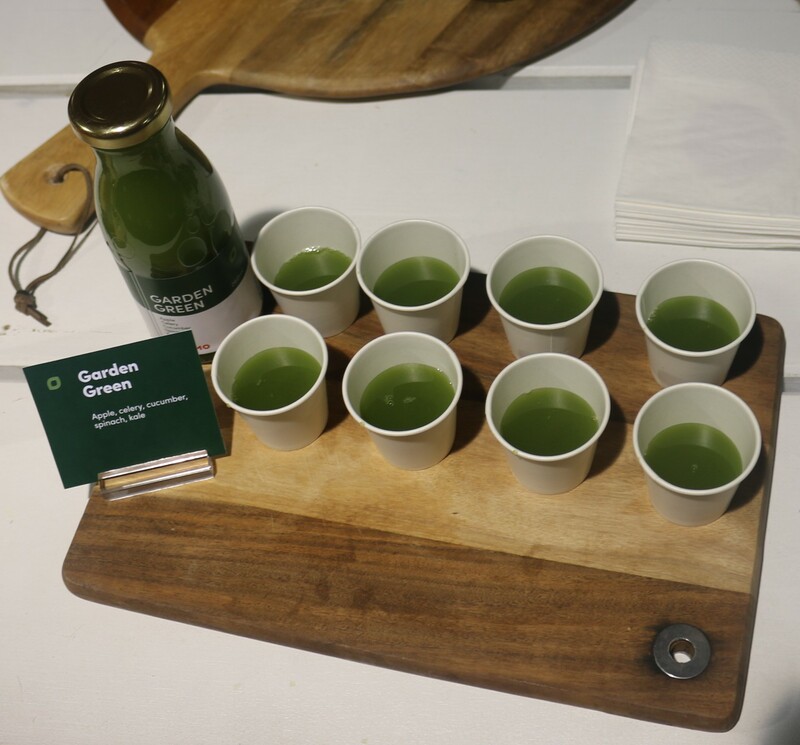 The ‘garden green’ is not one of those green juices where you want to barf each time you take a sip. This is a friendly green juice and has a sweetness to it. It had cucumber, kale, celery, spinach and apple. All the good green stuff but not bitter at all. We tried the ‘Summer lovin’ which was delicious. This was one of my faves. It had apple, pineapple, lemon and mint. It was light and refreshing and would definitely be a popular one for summer, ah the name now makes a lot of sense. 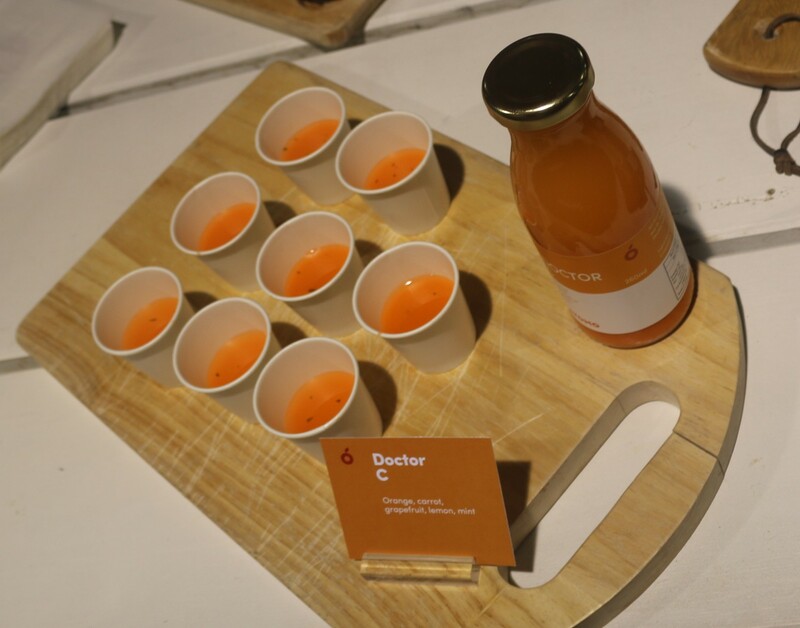 The ‘doctor c’ was tasty, I thought it would just taste like orange because of the bright orange colour but it was light and had a fusion of flavours. It had orange, carrot, lemon, grapefruit and mint. 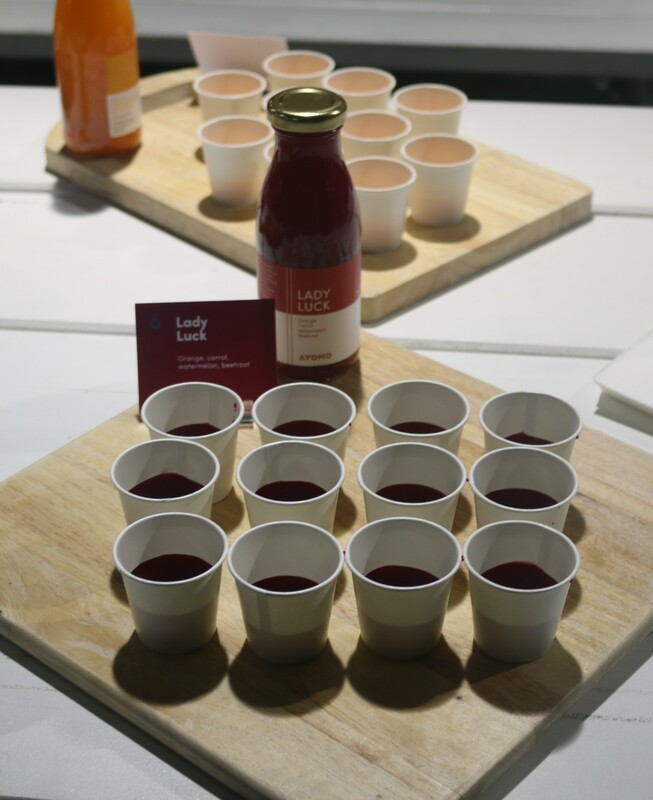 The ‘lady luck’ juice had a really alluring flavour. It had a lot of depth and excitement about it. It was beetroot, watermelon, orange and carrot. I really liked this one. There was eggplant dip with pita chips. The Ayomo stores do have some savoury items like this pita and dip combo. All things healthy of course. I hadn’t tried kale chips before and these ones were surprisingly tasty. They had heaps of flavour and were not super bitter as I had imagined. They were so delicate and crunchy, a good alternative for potato chips. 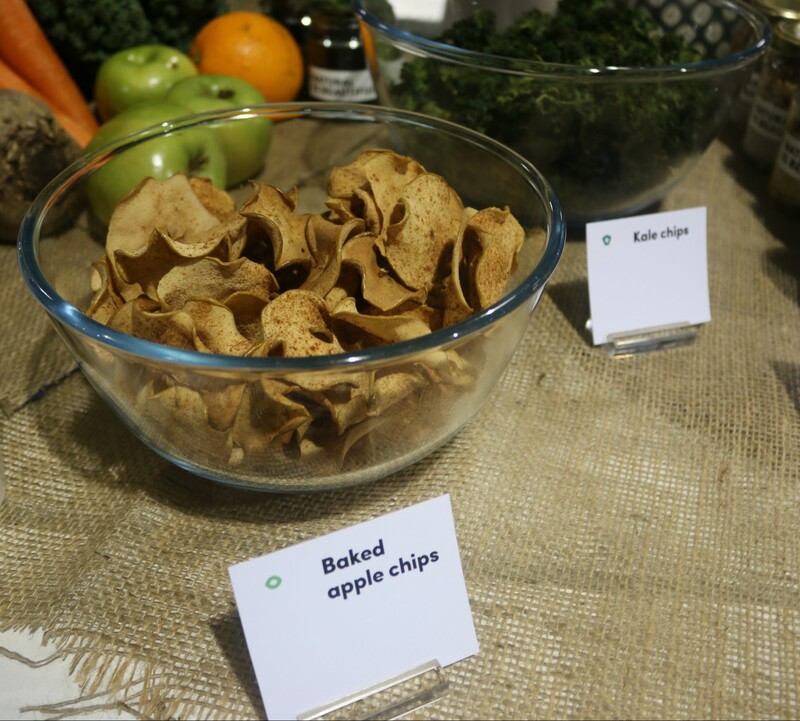 They also had apple chips, which were crisp and sprinkled with cinnamon. They were a nice crunchy sweet snack. I’m a big fan of their homemade granola. It had a mixture of lots of things delicious. Oats, nuts, cranberries, coconut, cinnamon etc. Yum. 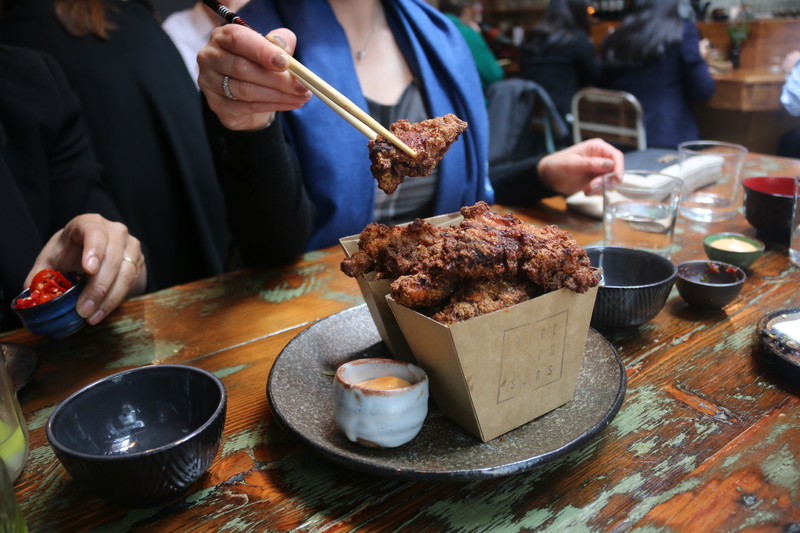 It was crunchy which I like and I especially liked the buckwheat clusters through the mix. 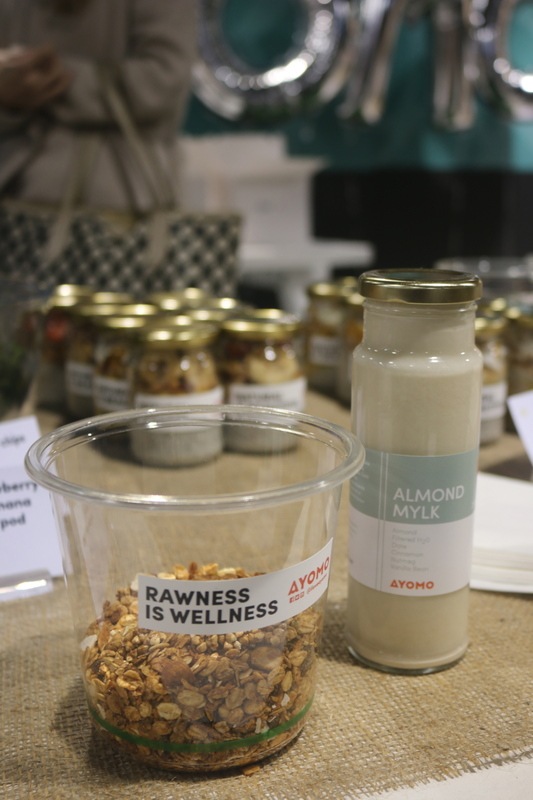 It went perfectly with the almond mylk, which had a lovely smooth creamy flavour The almond mylk had vanilla bean, filtered h20, dates, cinnamon, nutmeg, sea salt, almonds. Delish. 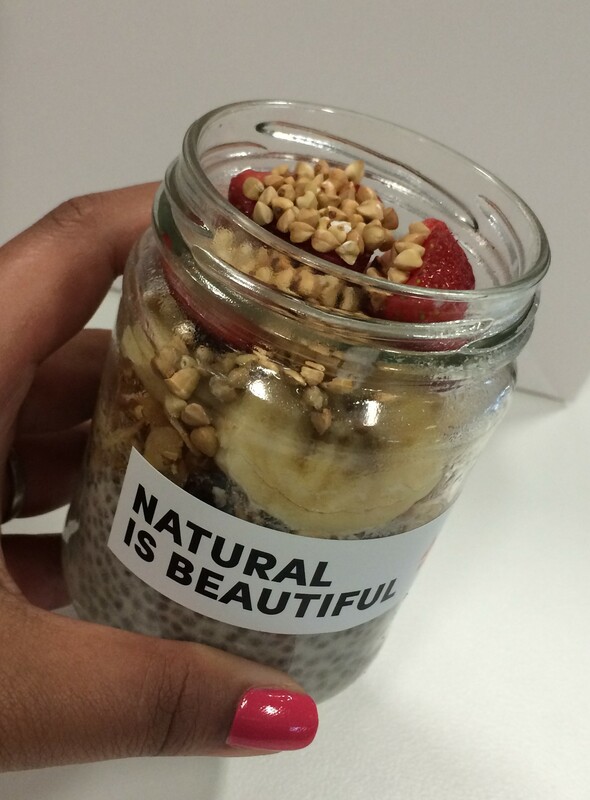 The banana and strawberry chia pudding, which was tasty. Fresh fruit, creamy gooey chia and crunchy buckinis on top. Lots of texture and delicious too. Om noms! In hindsight I should have been in the O for Olive Sundays instead of the M for Mel. Ah wells. 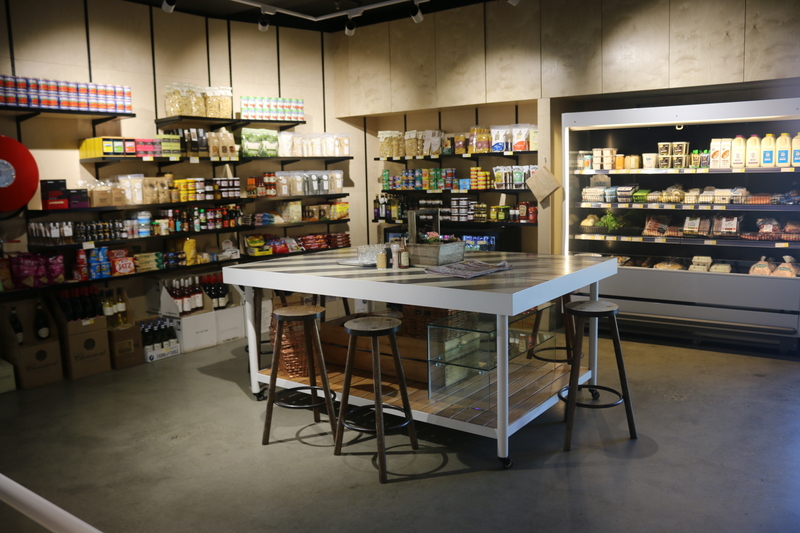 Their South Melbourne store also has raw shakes, super bowls (like acai or peanut butter), frozen yoghurt and frozen cold pressed juice. Frozen cold press juice?! Yes its a new thing and would sort be like a fruity sorbet maybe. Can’t wait to try it. Ayomo juices are oh so popular because they are healthy but more importantly they are delicious. Also its convenient and exactly what I feel like on a warm spring day. Yay to spring! 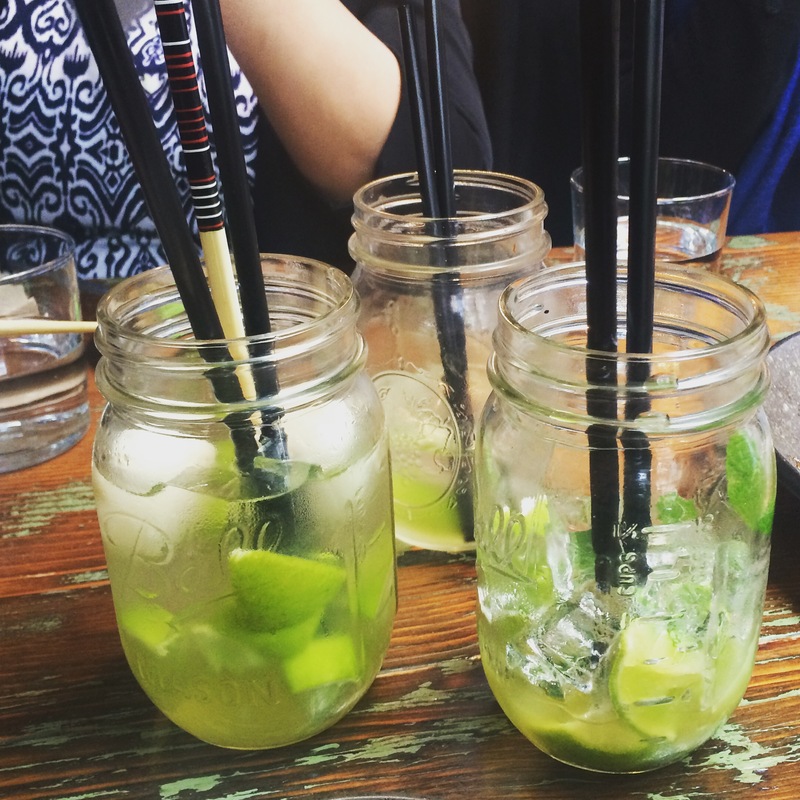 Bring on the sunshine and bring on the healthy cold pressed juices. 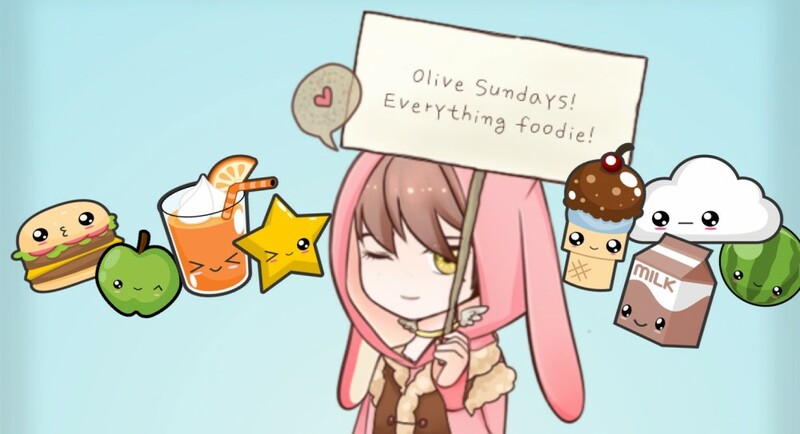 Note: Olive Sundays was invited as a guest to Ayomo. 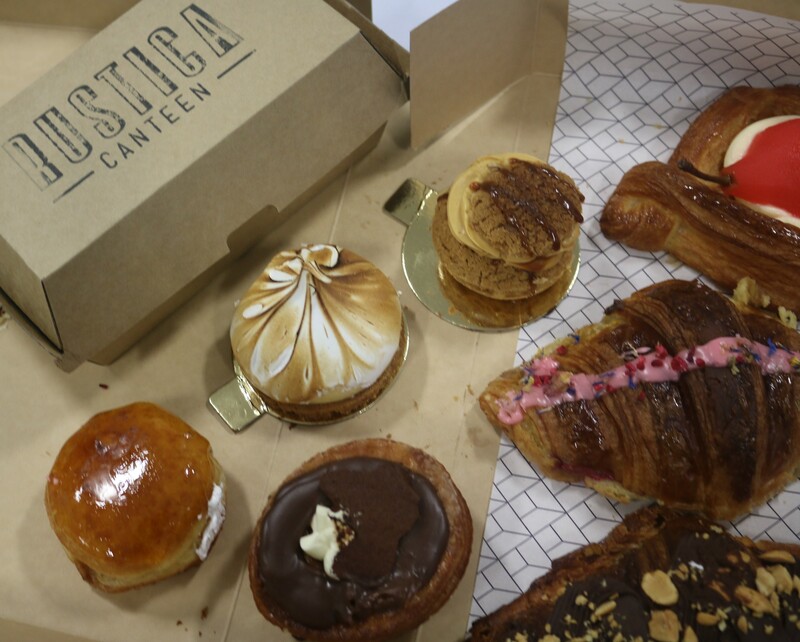 Rustica Canteen opened in the city 2 minutes away from my work huzzah! 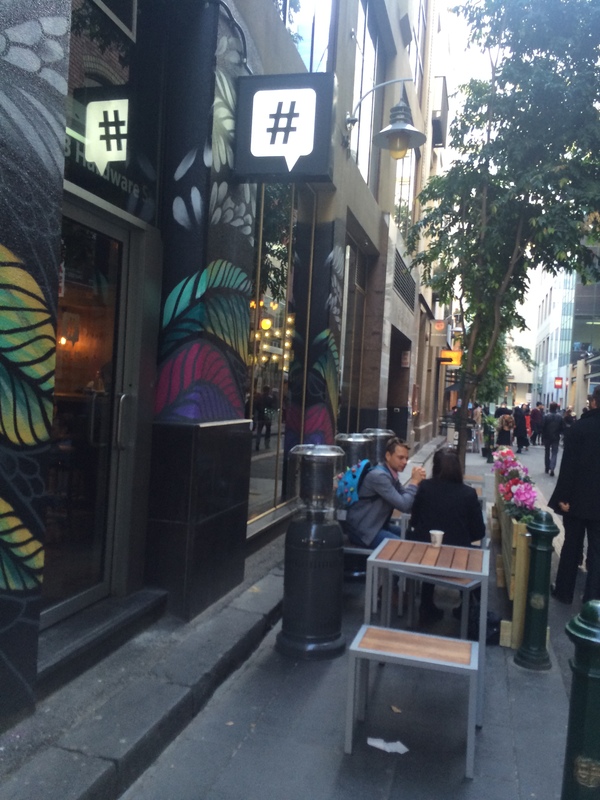 They opened in Guildford lane just this week and it is definitely something to be excited about. 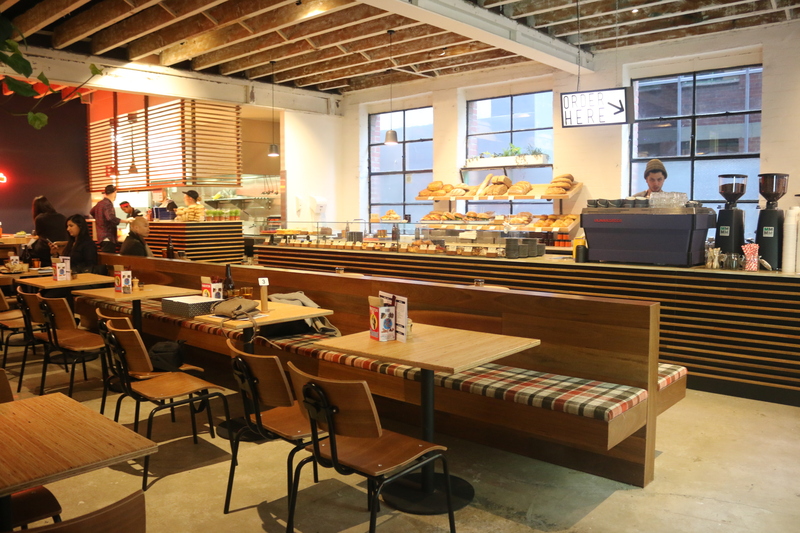 Similar to their Fitzroy store (Rustica Sourdough), the restaurant is part bakery part dining space. Behind the counter are shelves of fresh loaves of bread and across the front bench there is a display of delectable French pastries. 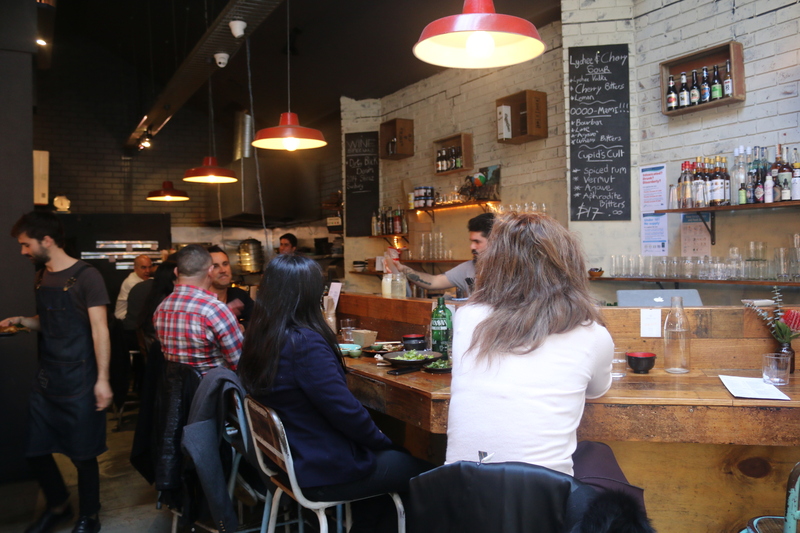 It’s a beautiful open space with modern décor and delicious dining for breakfast and lunch. It’s a really nice inside. This sign was so cute. We got what you knead haha. I had a breakfast salad because I knew I was going to spend a morning eating indulgent pastries so I though it would be good to get some greens in. This salad was delicious. It was full of flavour and had great texture. Full of super foods too. 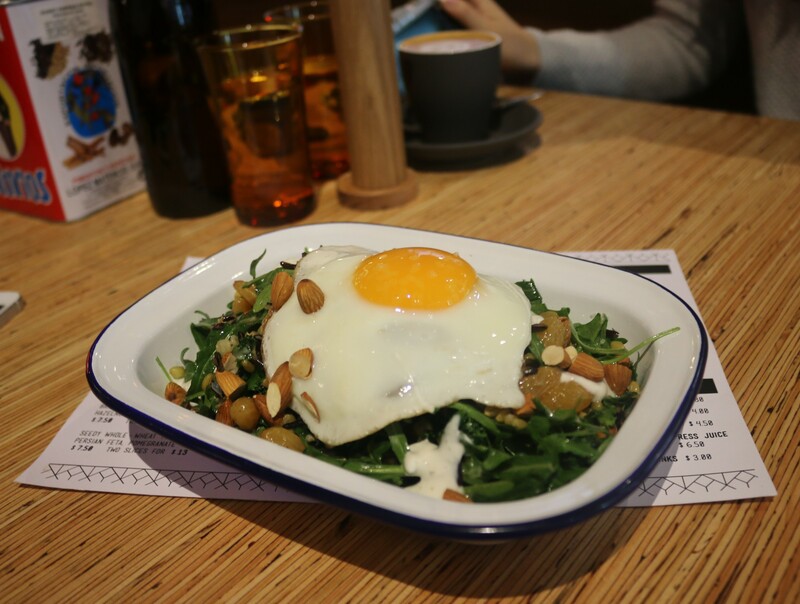 It had a combination of freekah, wild rice, kale, rocket, chai soaked raisins, toasted almonds, minted yoghurt and a fried egg on top (runny yolk of course). Amazing. The croissant with chilli scramble was tasty. 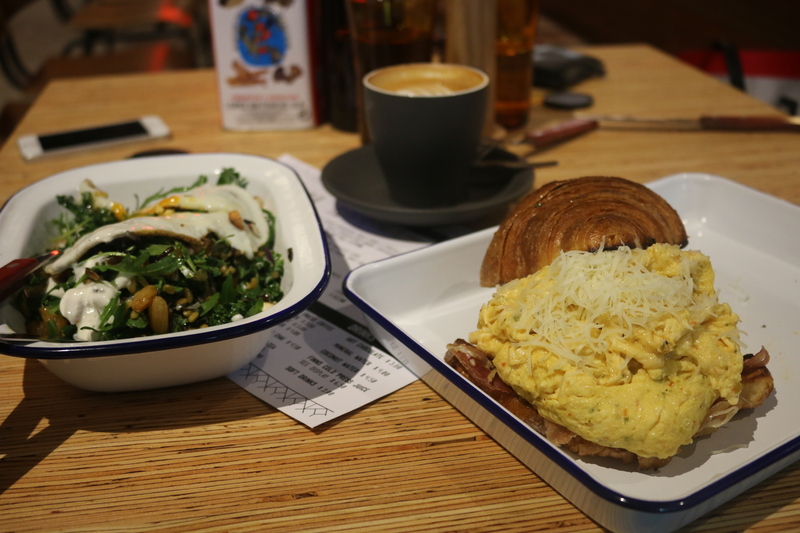 The croissant was buttery and toasted and there was a generous mountain of scrambled egg with mild chilli, Serrano jamon and manchengo cheese. It had lots of Spanish flavours, it was yum. 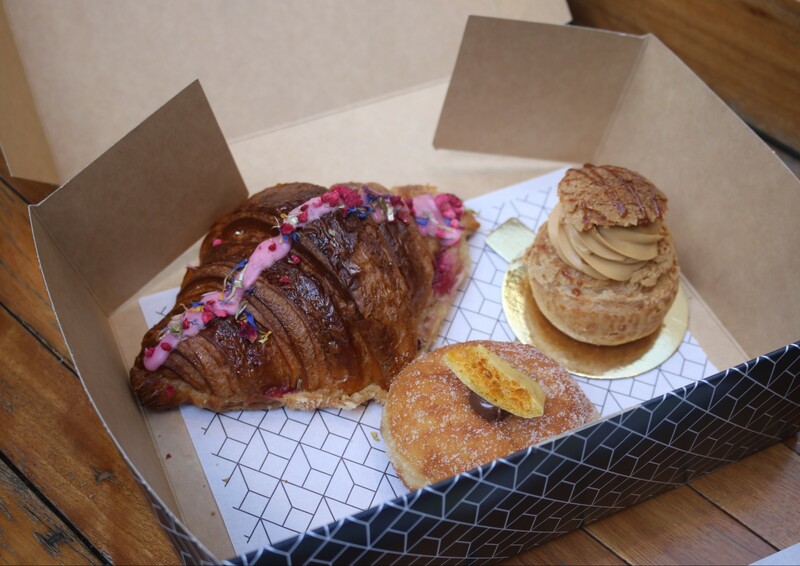 It’s hard not to leave the place without a box full of pastries and a couple of loaves of fresh bread because they are on display and they look fabulous. I was like I want that and that and maybe that and also that and I wanna try that too. The pear danish was incredible. It was simple but the flavours really stood out. 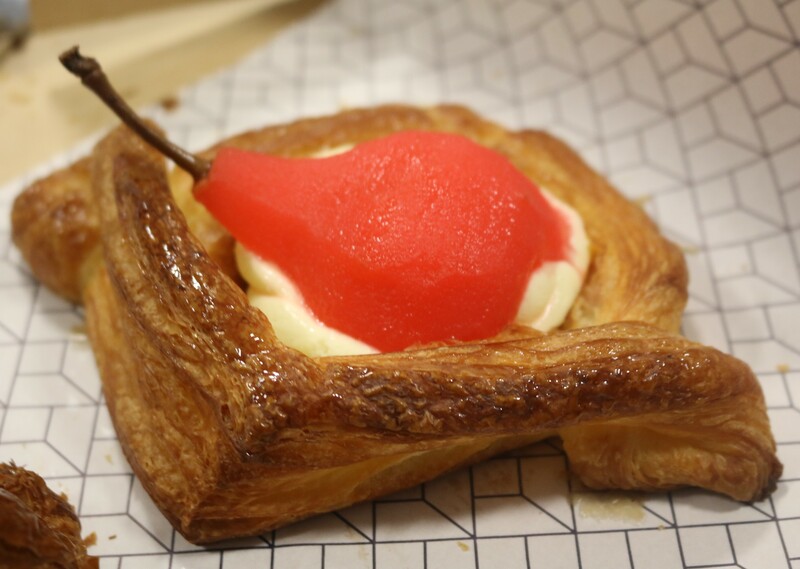 The poached pear had a subtle fragrant rosewater flavour the cream cheese frosting was light and delicate and then the danish pastry was crisp around the edges and super buttery. The flavours together were remarkable. 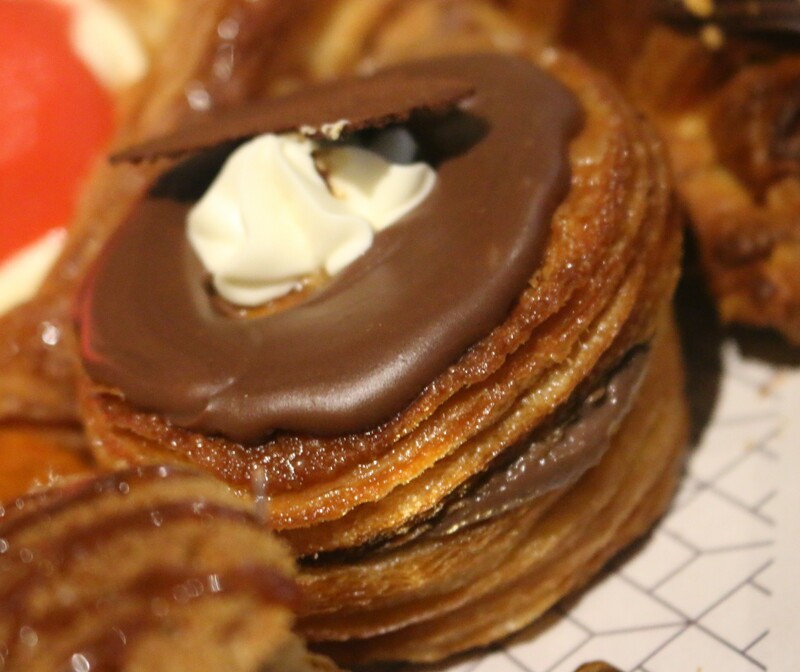 The milo cronut was pretty special. It was shaped and fried like a donut but had the crisp buttery layers of a croissant. Then if that wasn’t enough, it was filled with chocolate milo custard and topped with cream, chocolate and a milo crisp. 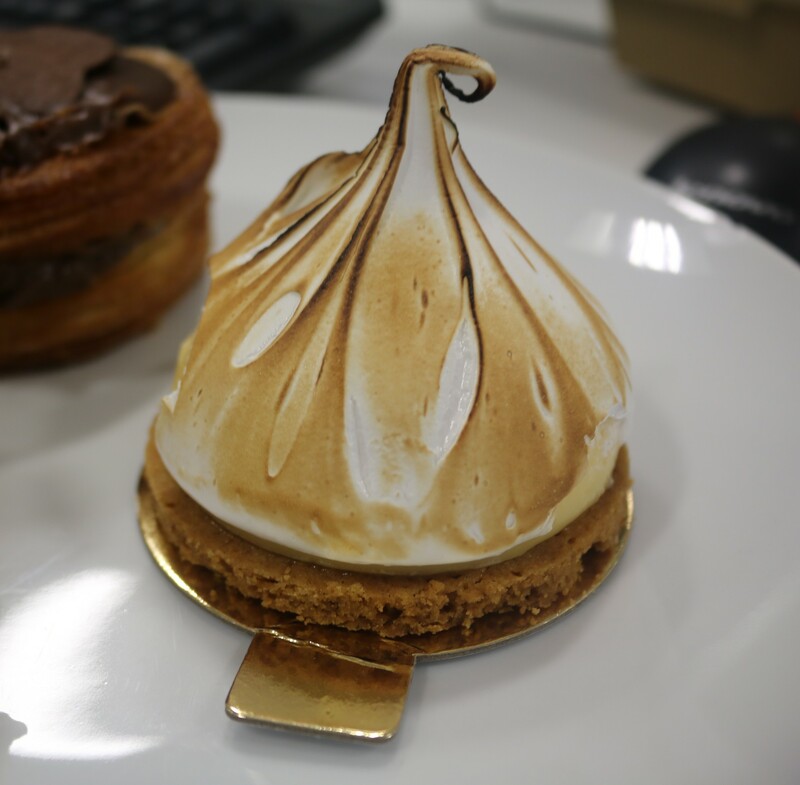 The lemon meringue tart in this photo got a bit mangled in transit. 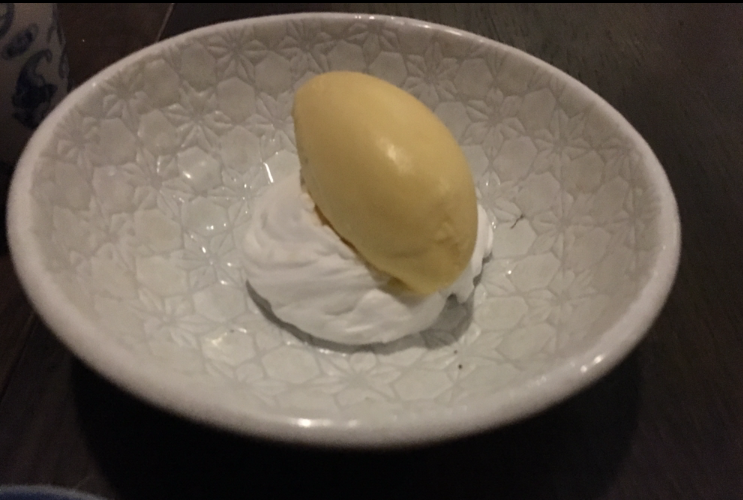 The meringue was so delicate and soft and the on the inside it had a sweet creamy lemon curd in the centre and a crumbly shortcrust pastry base. 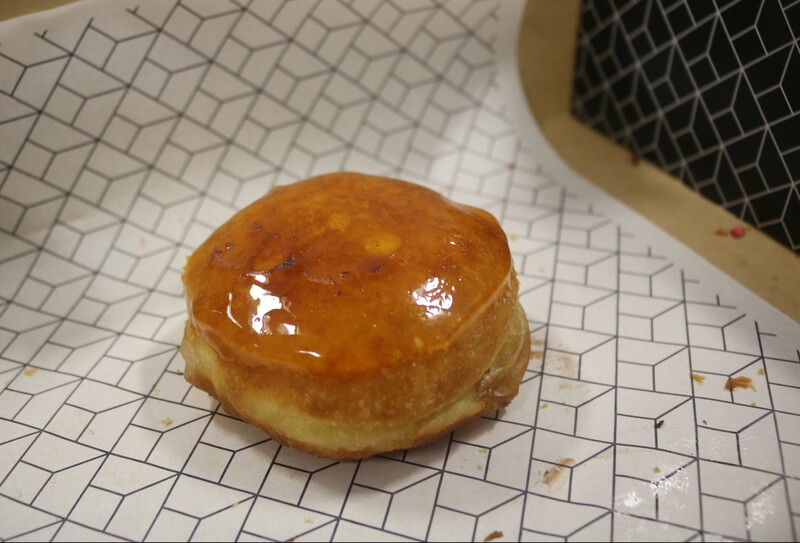 The creme brûlée brioche donut was delicious. It had a hard toffee top with a crème brulee filling. There was a thick layer of toffee on top but it was easy to bite into it kind of had a lolly candy kind of flavour. Then there was a creme brûlée filling inside the soft fluffy donut. Yum! 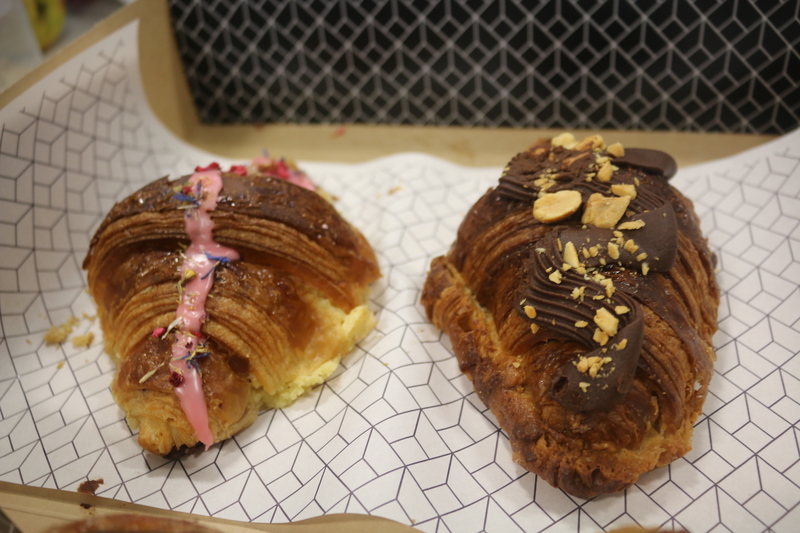 The chocolate and peanut butter croissant was pretty amazing. It was a twice baked croissant filled with a peanut frangipane, it had chunks of dark Belgian chocolate and was topped with chocolate ganache and chopped roasted peanuts. It was delicious and not too sweet. The bitterness of the dark chocolate balanced out the sweetness. It was really good. The twice baked Ispahan croissant was delicious. It was filled with rose, lychee, almond and raspberry. It had the tartness of the raspberries, the sweetness of the lychee, the traditional almond filling and a floral hum of rose in the background. It had a perfect balance of flavours, it was lovely. and very pretty too. The salted caramel choux bomb was awesome. The choux pastry was delightfully crisp and crumbly and filled with a smooth and creamy salted caramel chantilly cream. Yum! This restaurant is a great place for brunch and they use high quality ingredients. 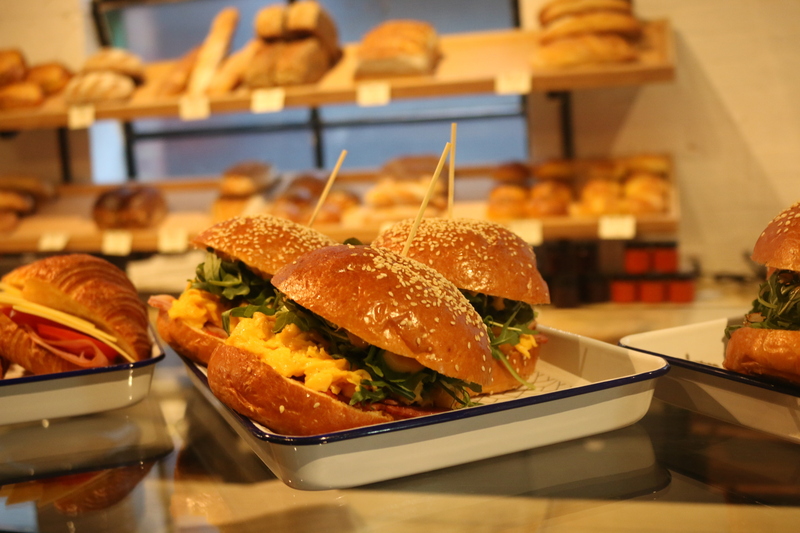 They have a range of delicious sandwiches for lunch and they bake their own bread so it doesn’t get fresher than that. It will satisfy the sweet toots, the bread lovers and the brunchers. Come one come all. It’s open. Yay!